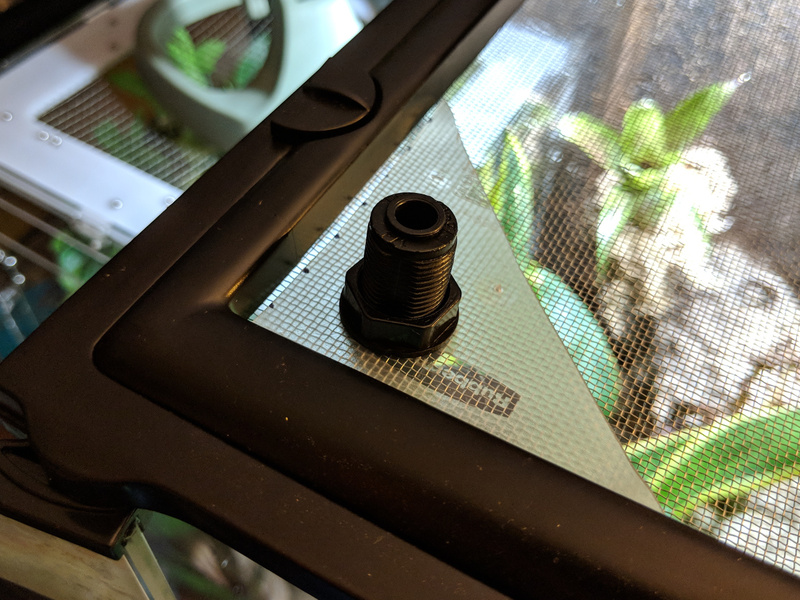 Since the DIY seal job on my acrylic vivarium started leaking, it's time for a rebuild in an 18x18x24 Exo Terra terrarium. 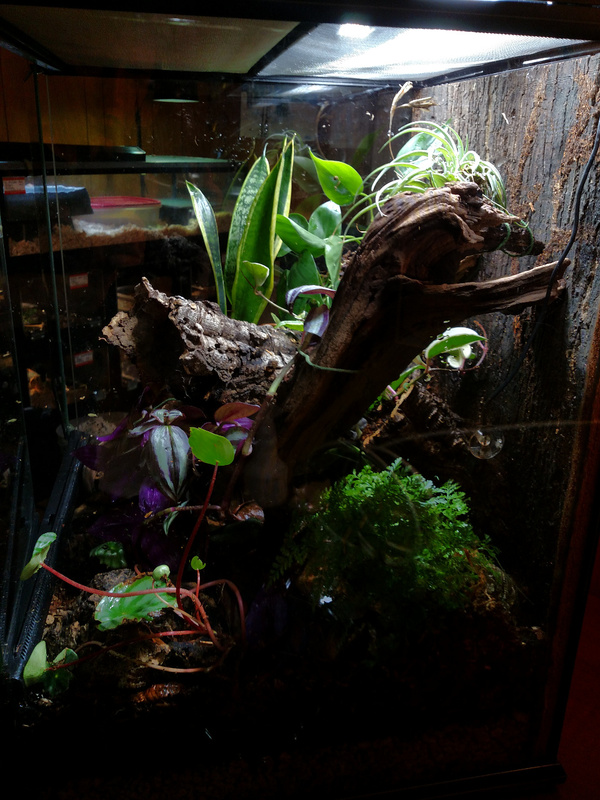 A lot of the plants and substrate from the existing viv will be transferred over to keep the bioactive base going, but I decided that I wanted to redo the background and wood features. In the original build, the planters just didn't do well, probably because they were too far up and easily dehydrated. 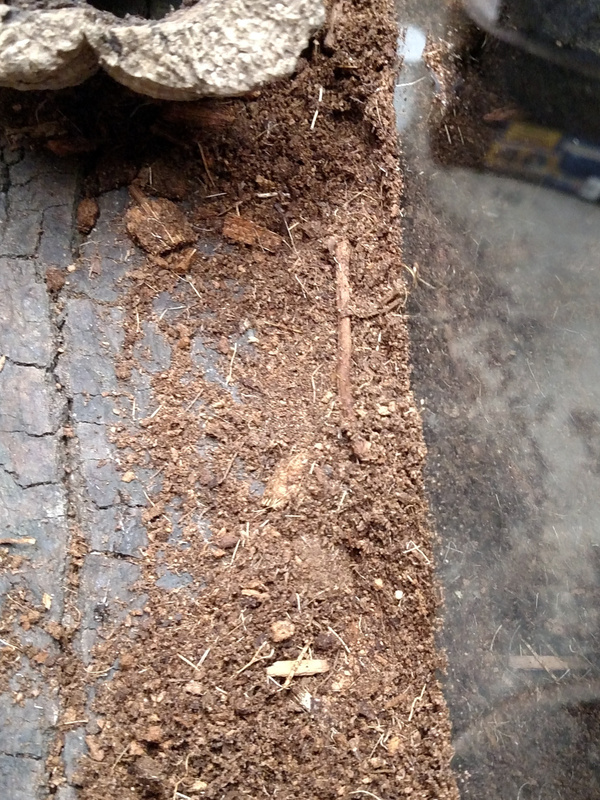 Luna, the crested gecko resident, never has used the cork branch crossbeams that I've seen, so those won't be included in the new build. 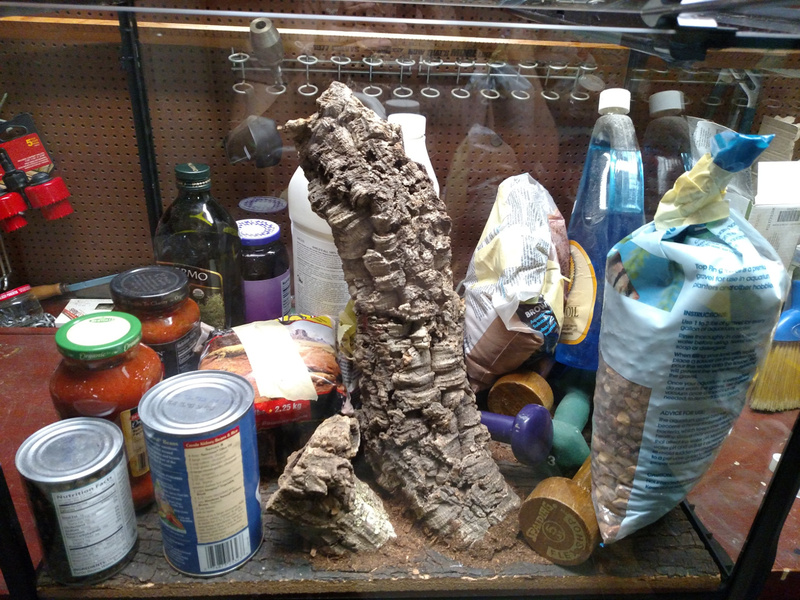 The cork tube "log", however, is an absolute favorite sleeping place during the day. The new build will include a similar feature. 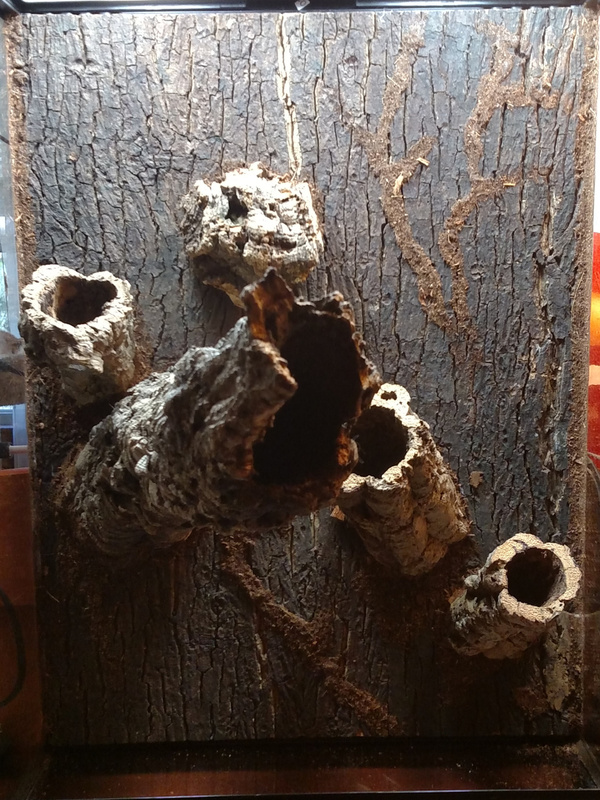 I completed the first stage today of building the background wall outside the viv. 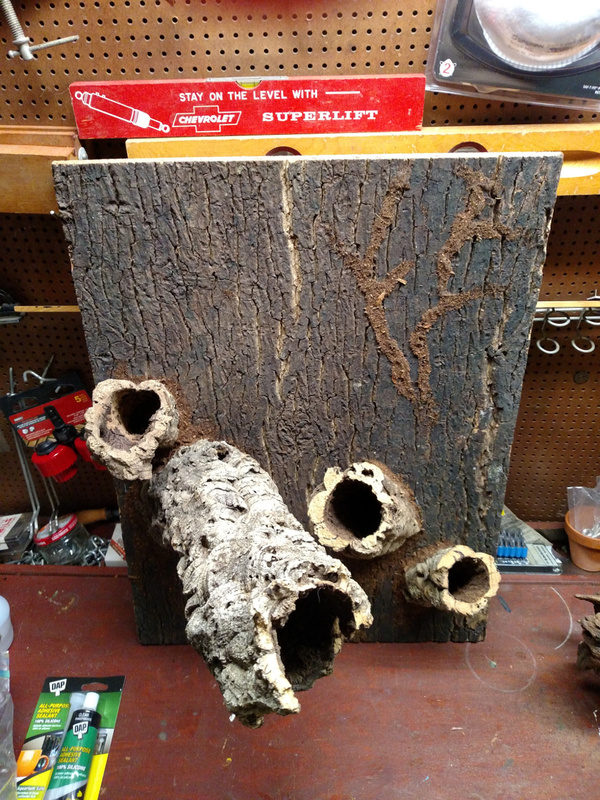 The background will need to cure for a few days before I can glue it into the Exo Terra enclosure. Good project for a long weekend! 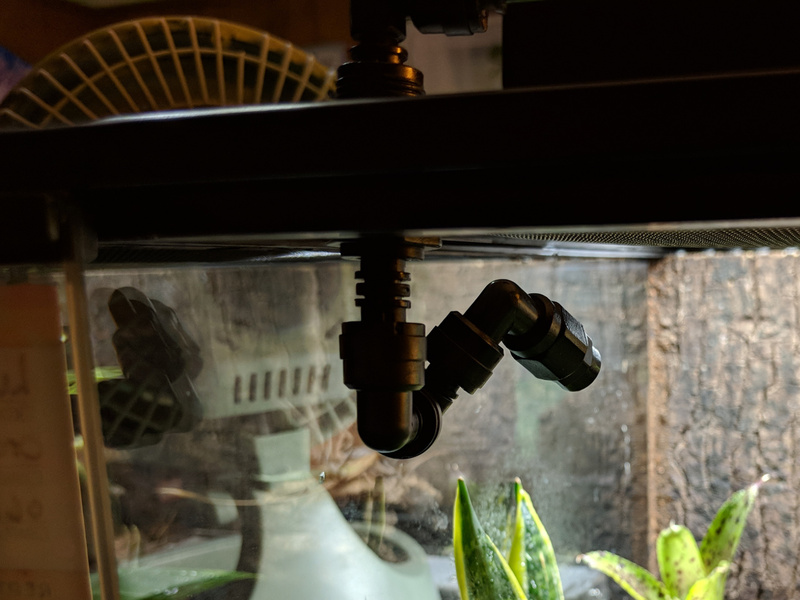 Note: The techniques here are described in a tutorial by New England Herpetoculture. Some of the materials were part of one of their background kits, while others were purchased separately. 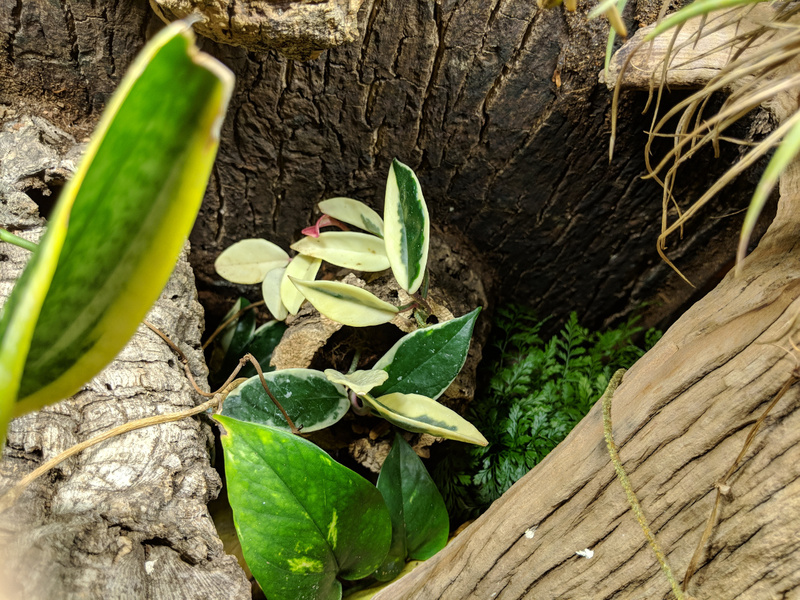 The pieces you can see in the pictures are a forest tile background, one large cork round, two small modular planters (essentially cork round ends with a 45-degree angle cut into the back), and one larger modular planter. 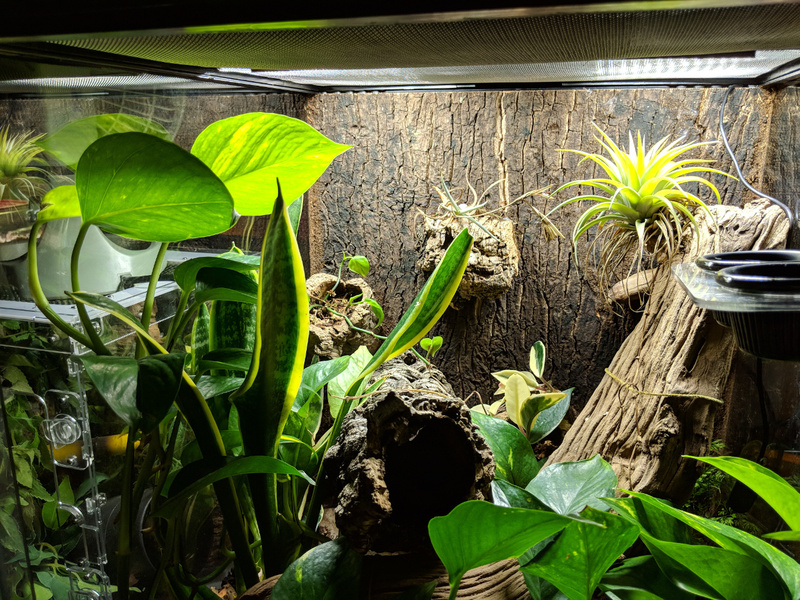 Not pictured is a large ghostwood branch that's going to run up through the cage, but I arranged everything together in the cage before deciding. 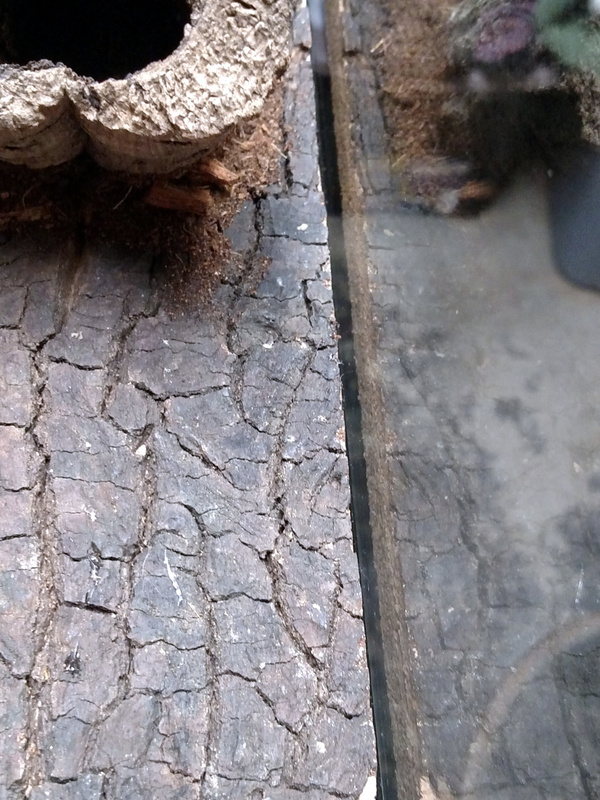 The "log" is a large cork round. I just took a saw to one end of it to get it to sit at an angle against the wall. When I finally found an arrangement I liked, I traced each one with a marking pencil. 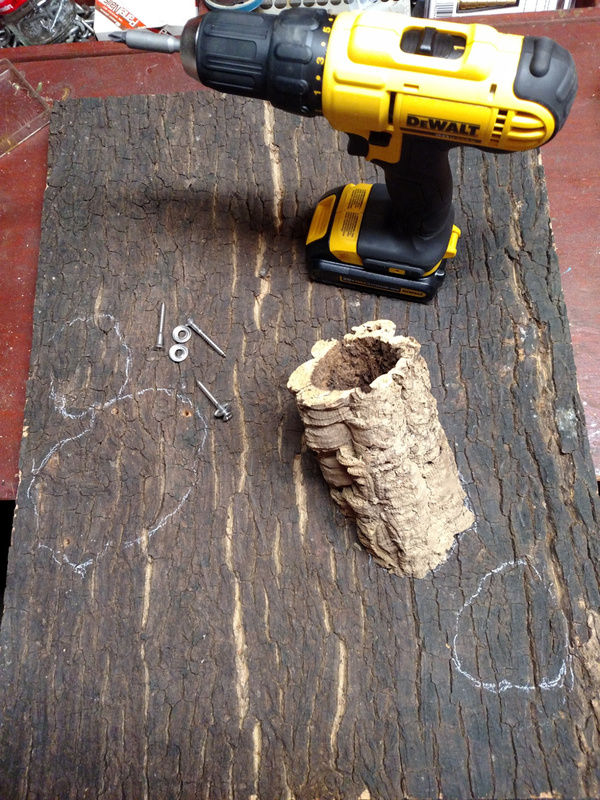 On the two larger cork pieces, I put marks where I thought support screws were needed and drilled some guide holes. 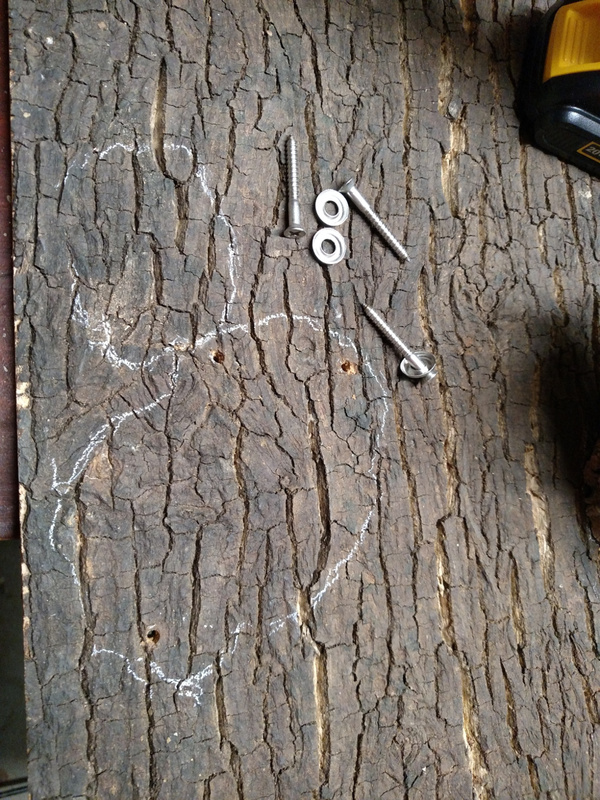 Then, screws with washes on them were fed into the back and up into the edges of the cork pieces. This is not as easy as it sounds. 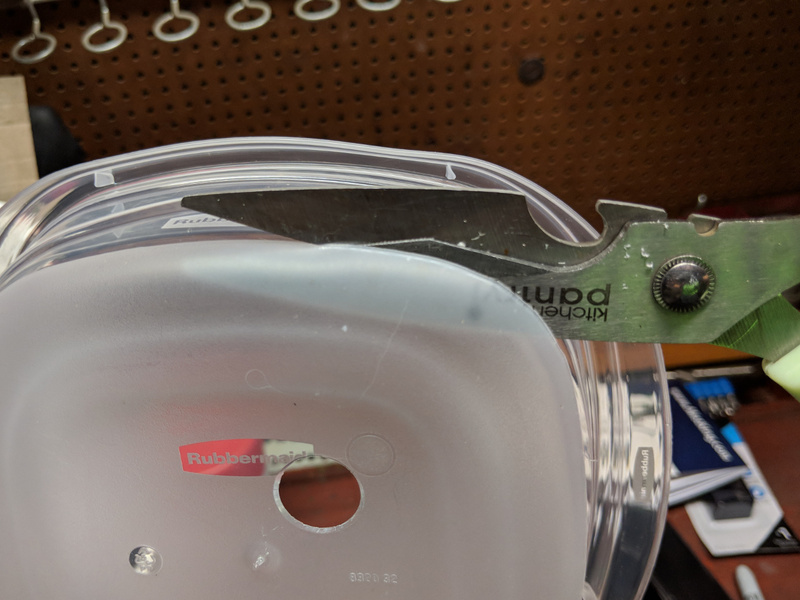 Two of my planned holes proved to be in bad locations (cork edge broke) and needed to be redrilled... ug. Whatever, eventually got the two larger pieces screwed down. 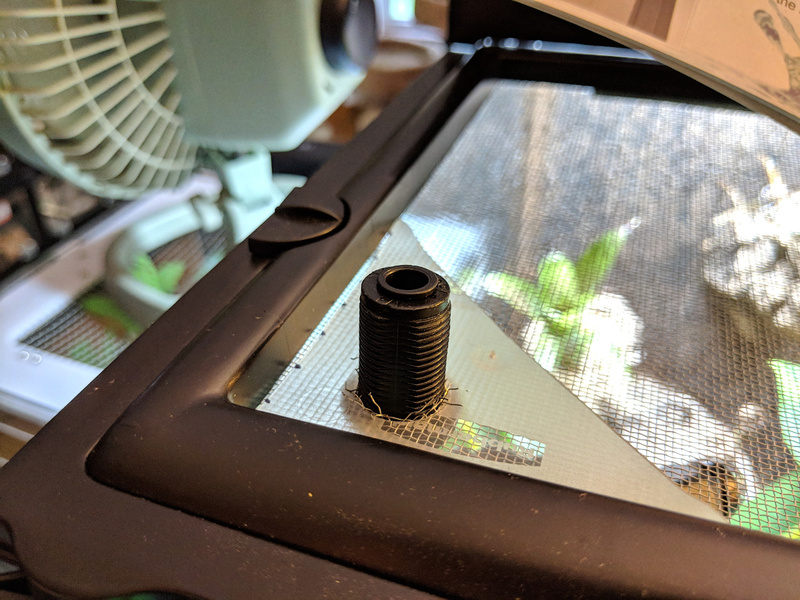 Next, I ran a bead of clear silicone aquarium sealant around the edges of the pieces to add more support to the screws. The two smaller planters were just glued right down with silicone. 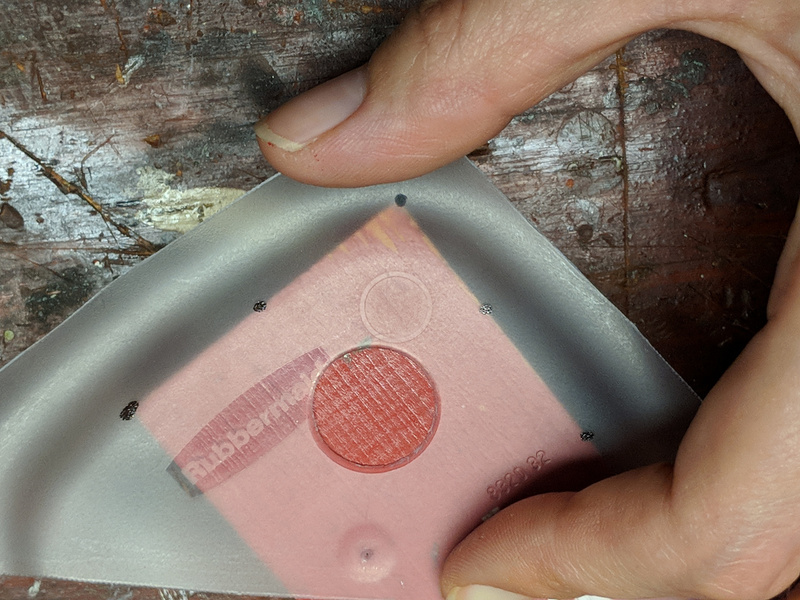 As I worked, I smoothed the silicone into the edges with a gloved finger and then pressed NEHerp's background mix onto the exposed sealant (it's a fine mix of coco fiber, peat moss, wood, etc.). When everything was glued down, I also ran some random patterns across the background and coated in background mix as well. The background had cured enough to be cleaned up and moved today. After vacuuming it off, I used silicone to attach it to the back wall of the Exo Terra. The background tile was a bit warped and didn't want to stay flat. That's why everything but the kitchen sink is piled in there! 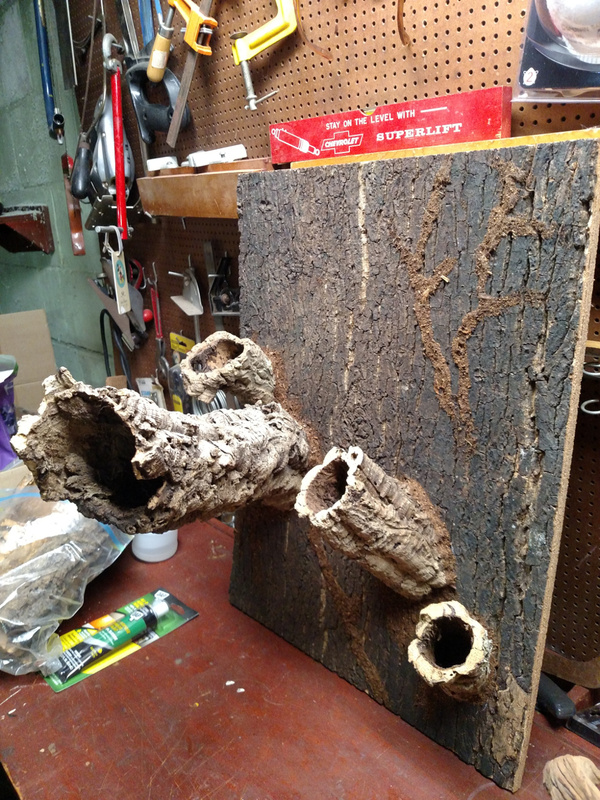 Also, the upper quadrant seemed a little bare, so I also tacked another chunk of cork onto it to make a little nub. It should be a good place to install an air plant. 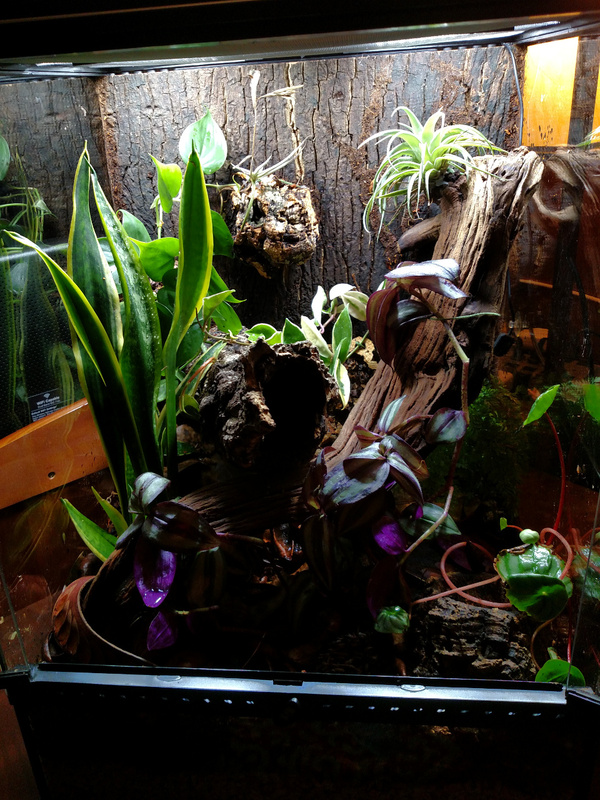 Just for fun, including a shot of the old vivarium that this is replacing. Sansevieria have grown in like crazy. 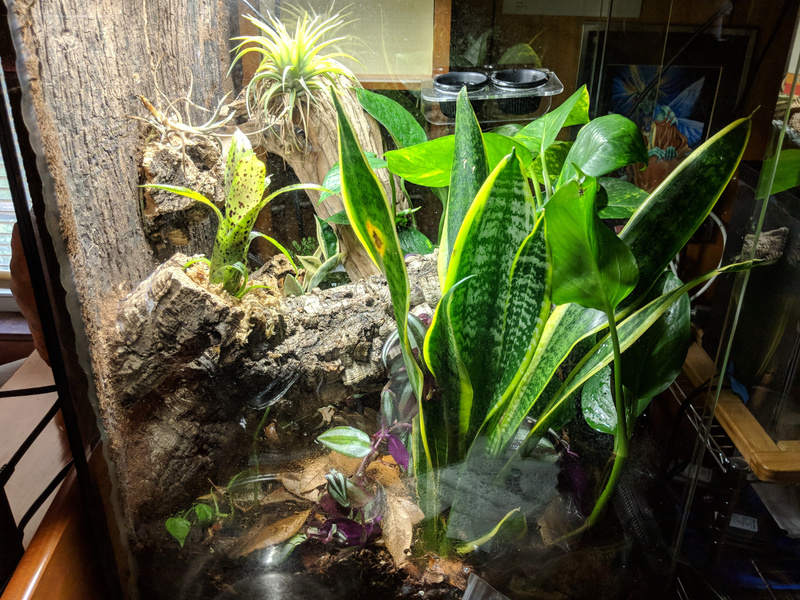 Need to trim those a bit before replanting in the new viv. 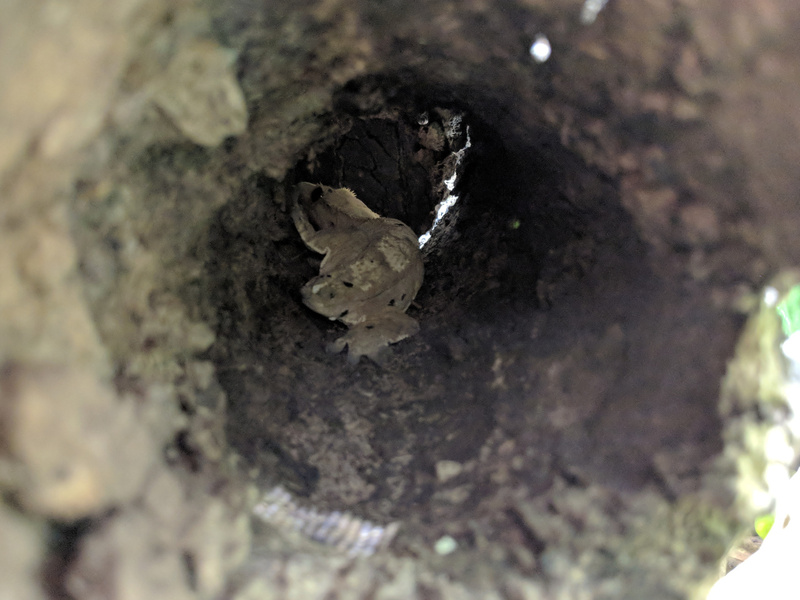 Whoops, even after a day under all that weight, there was still part of the middle of the forest tile that just wasn't sealed to the back of the tank. The gap was bugging me, so I ran a bead of silicone down either side of the panel and pressed it with background mix. That should provide some additional insurance and prevent anything from sneaking behind the tile (plants, custodians, whatever). Added back all the heavy stuff and will let it cure for the rest of the week until my new plants arrive. 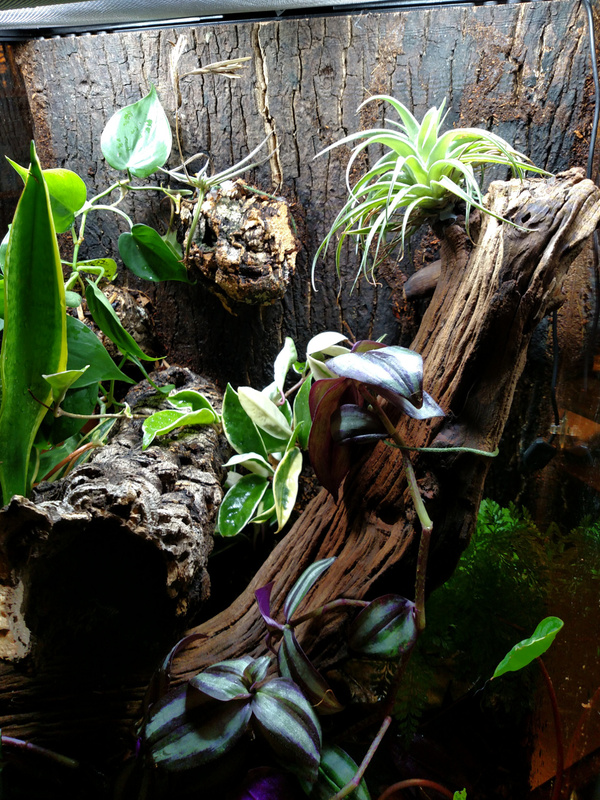 I ordered a few different varieties to supplement the Sansevieria and Tillandsia that I will move from the old viv. It's the most exciting day... planting day! 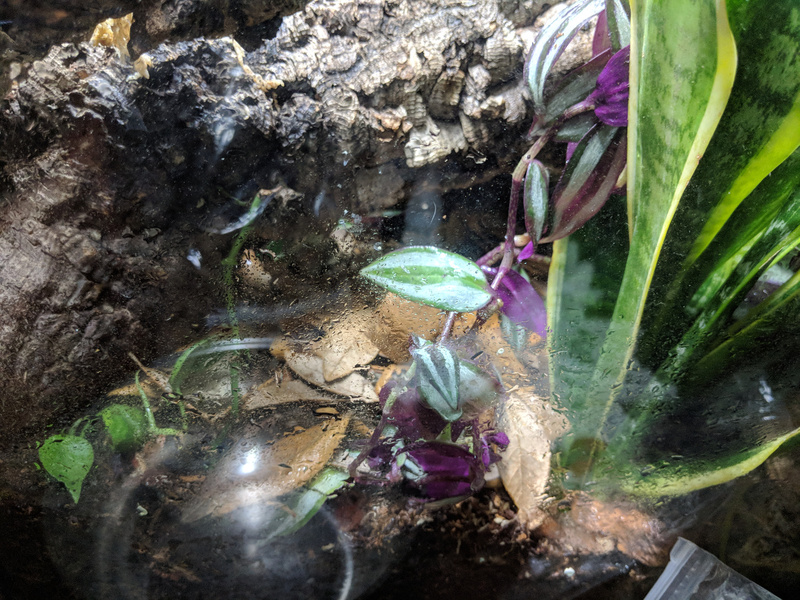 I did a lot of research on what plant species I wanted to add to my vivarium this time around and ordered plants from Amazon and NEHerp. 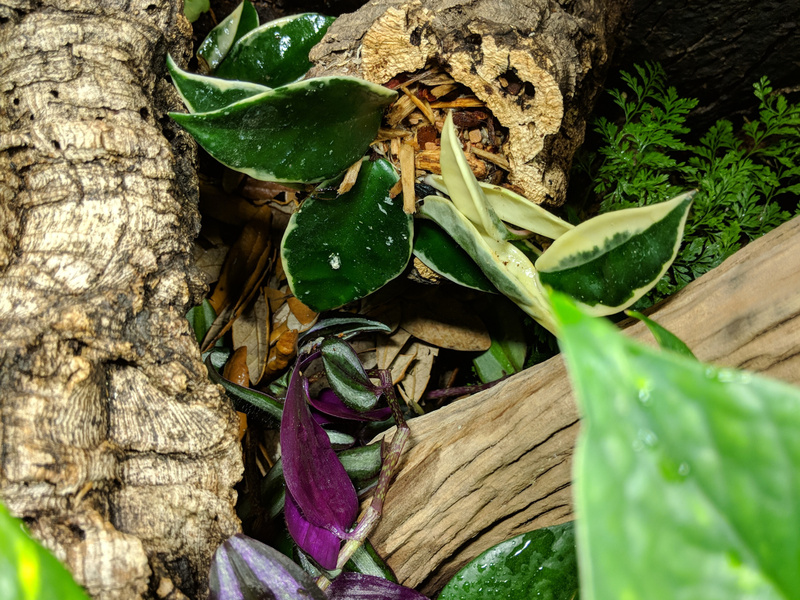 They took a little while to get here, but I'm really excited to try to keep this vivarium maintained better than the last one. You can see the background all cleaned off inside the Exo Terra and ready to go. 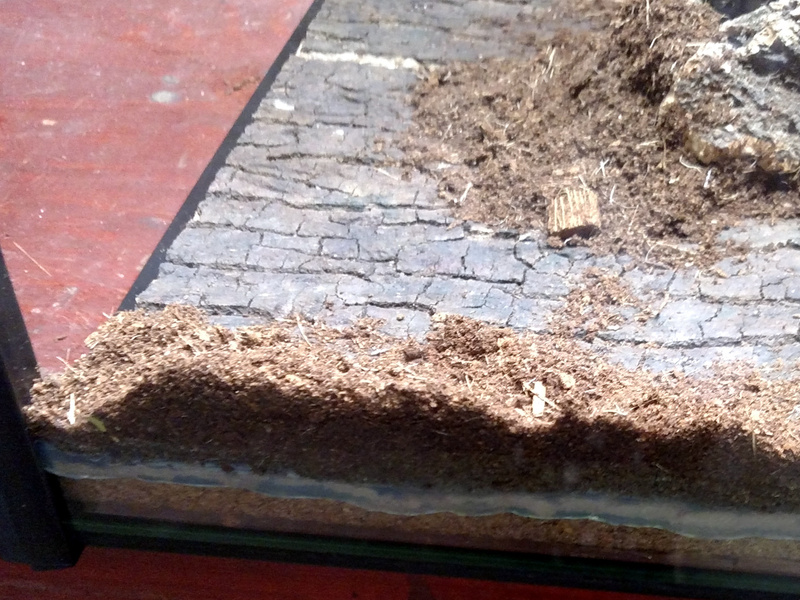 Next, it's time to put in the drainage layer (NEHerp LDL) and screen separator. 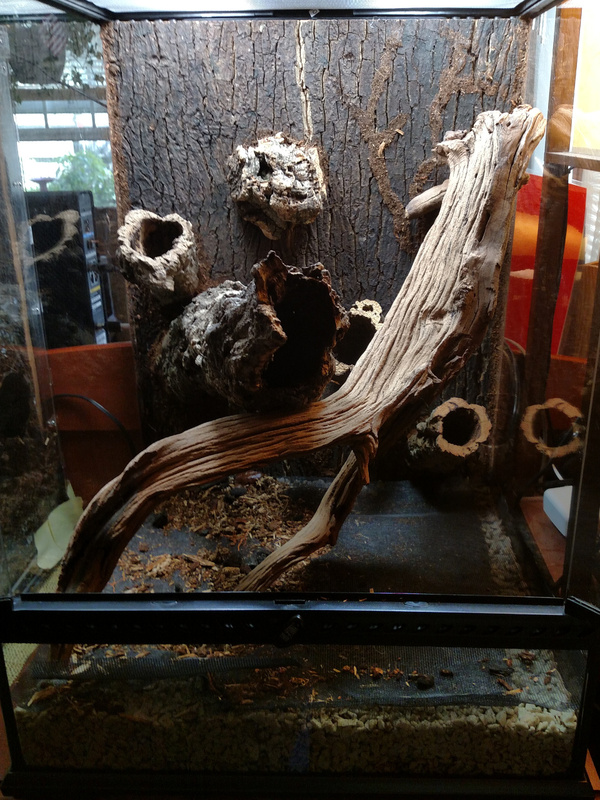 Then, I positioned the large ghostwood piece to run through the cage. 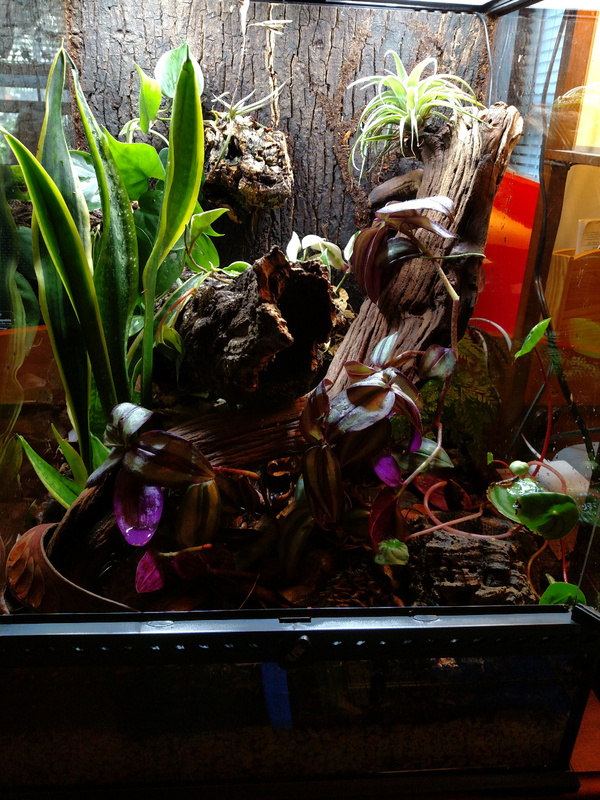 And, the most exciting part, substrate (NEHerp vivarium substrate v. 2) and plants! 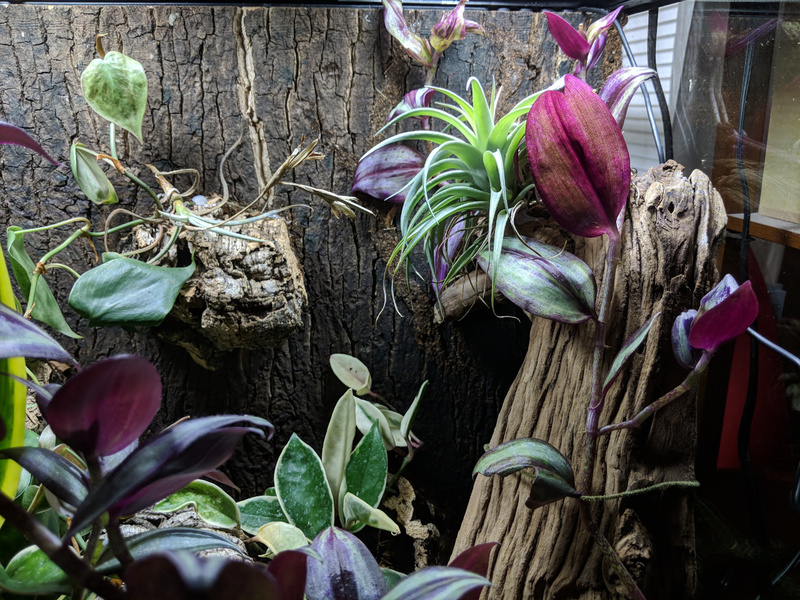 The Tillandsia, Sansevieria, and Peperomia all came from Luna's old viv. 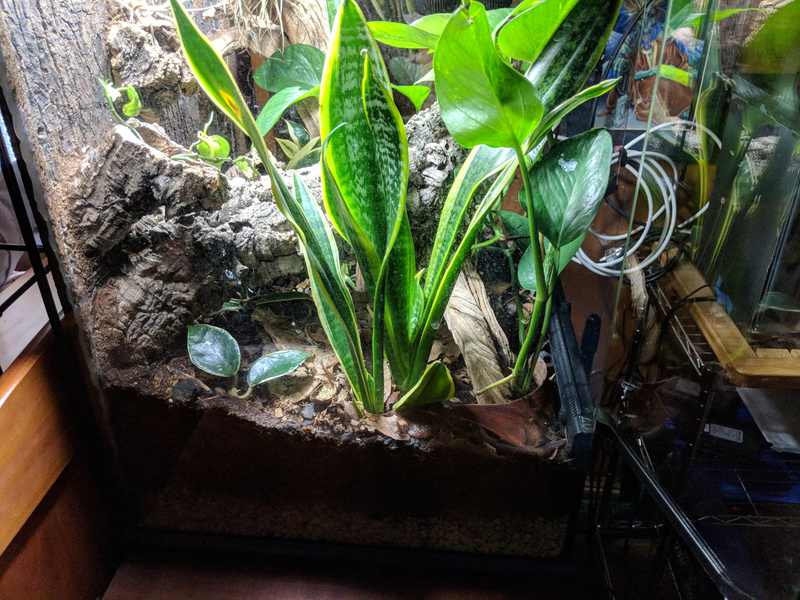 I left a LOT of the Sansevieria out of the new one. 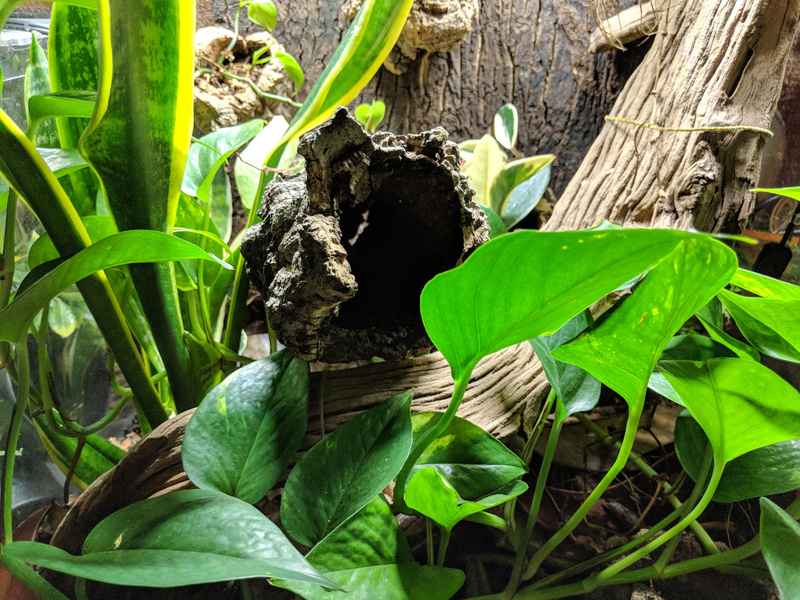 It totally took over her old viv. 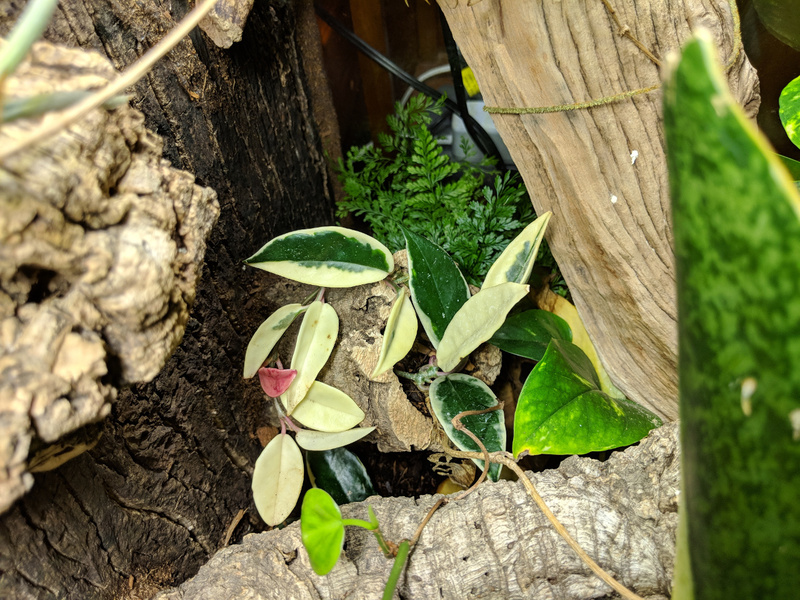 The Peperomia wasn't doing well, so hopefully I can figure out what's wrong and improve its condition in the new viv. 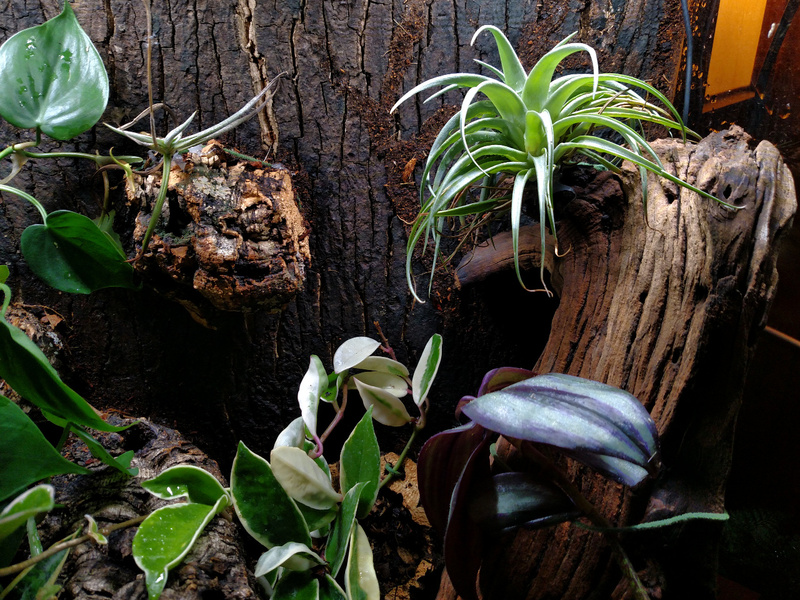 Plants positioned using floral wire where necessary, and hot glue applied to air plants. 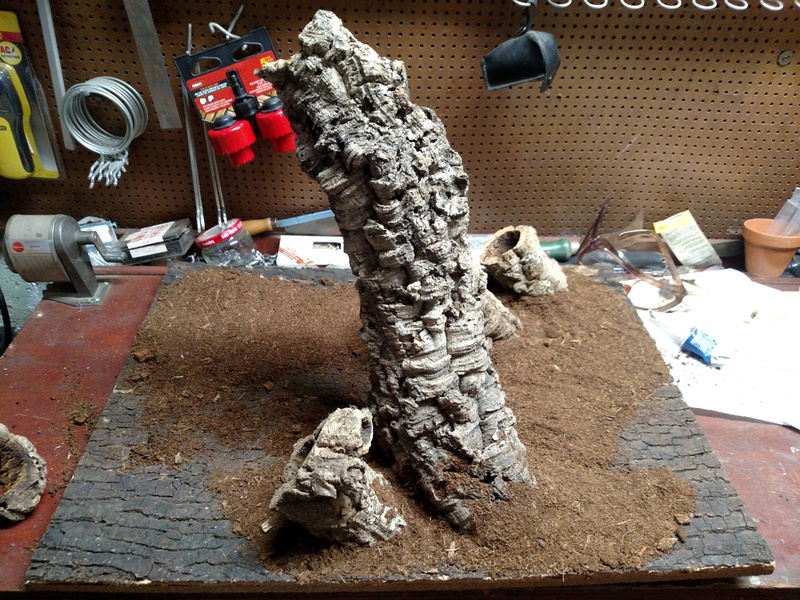 Top layer after all the planting was done is mixed leaf litter of oak and magnolia, as well as a few accents: a slice of cork round, some Caro Caro tree pods, and magnolia seed pods. 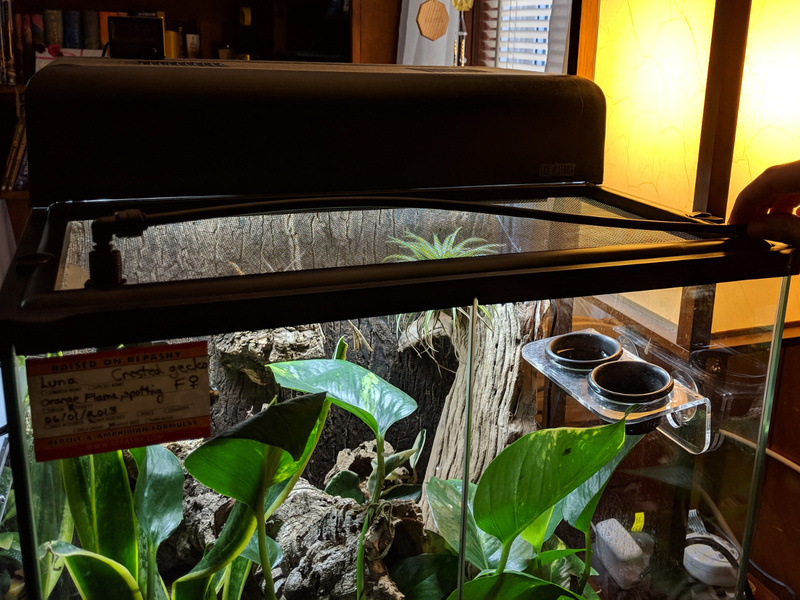 For this new viv, I traded in the two 23 W compact fluorescents in my Exo Terra Compact Top (Small) for two 13 W Jungle Dawn LED bulbs. 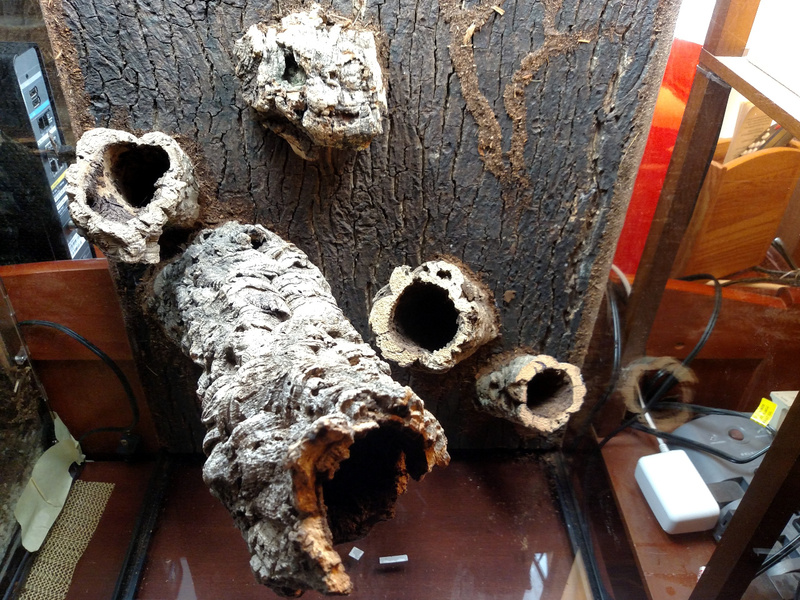 The lighting is definitely brighter, and I hope this will help some of these bright light species do well. Now, this gets to acclimate for a month while Luna is put into a smaller quarantine cage (poor Luna!). 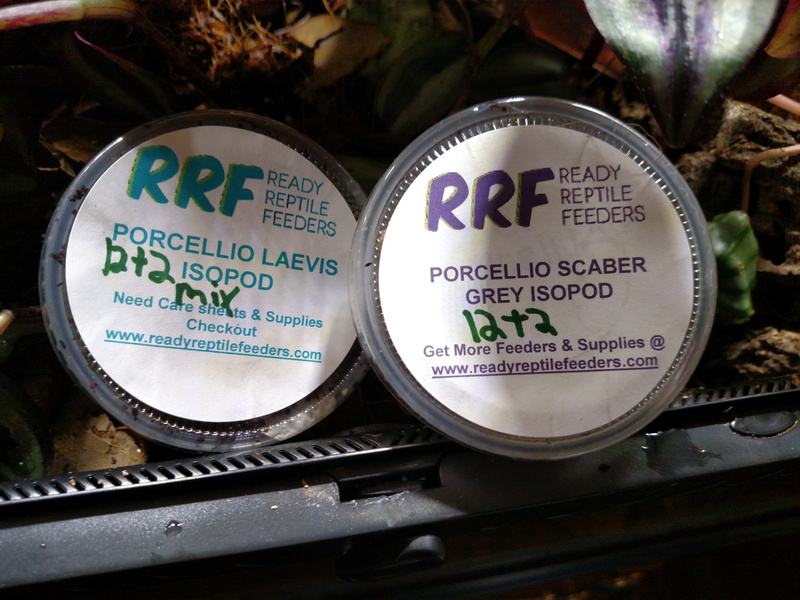 Some new custodians arrived from Ready Reptile Feeders yesterday. 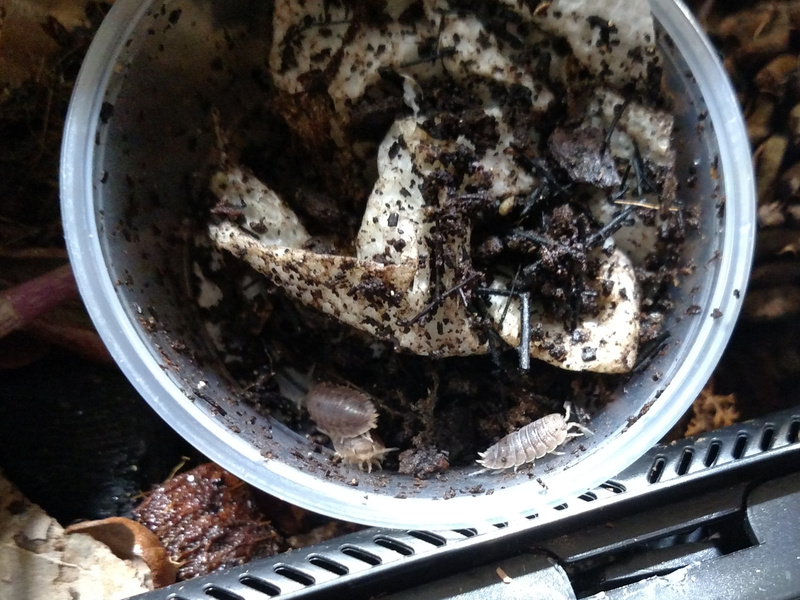 I had to restrain myself from ordering every species of isopod they sell... lol The species I settled on were Porcellio laevis (smooth isopods) and Porcellio scaber (gray sowbugs). 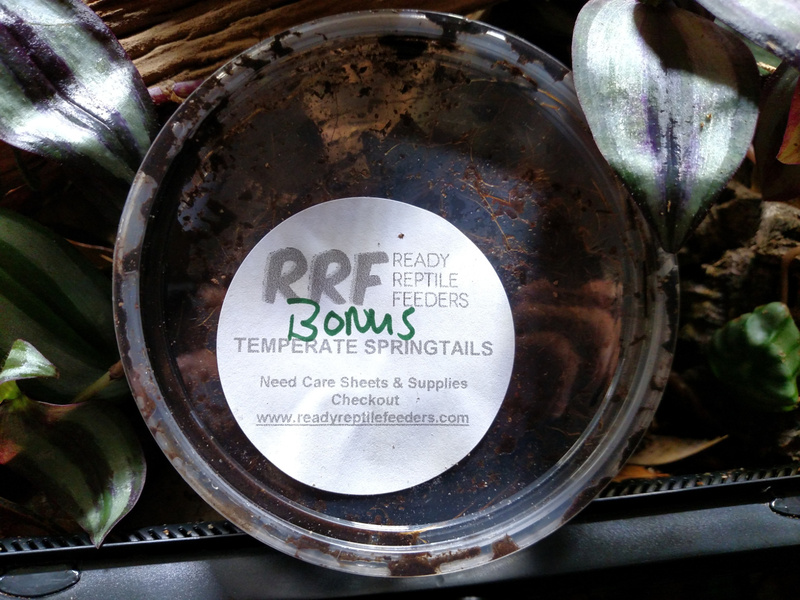 Ash at RRF was really awesome and included a bonus starter of temperate springtails to help beef up my custodian population! Woot! 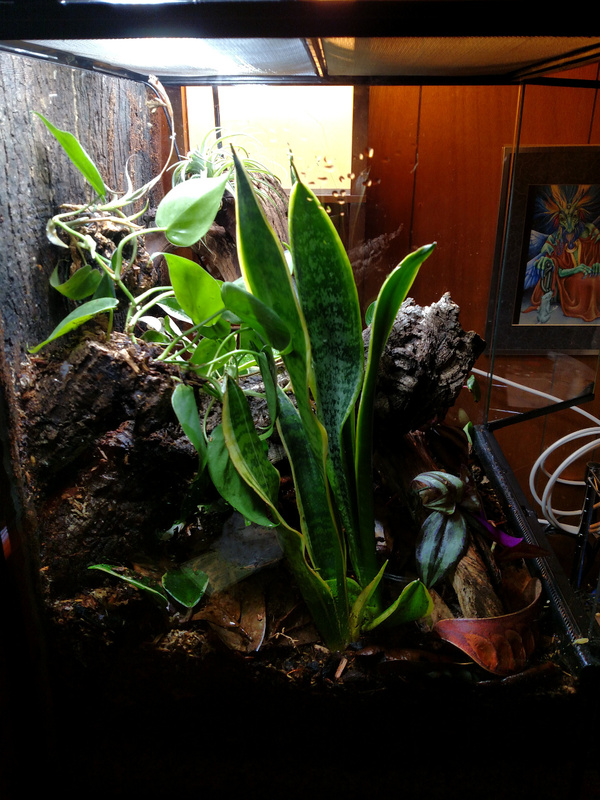 So far, the plants in the vivarium are doing well and haven't died back much. I'm trying to be extra careful about misting and watering this time around. Fingers crossed! 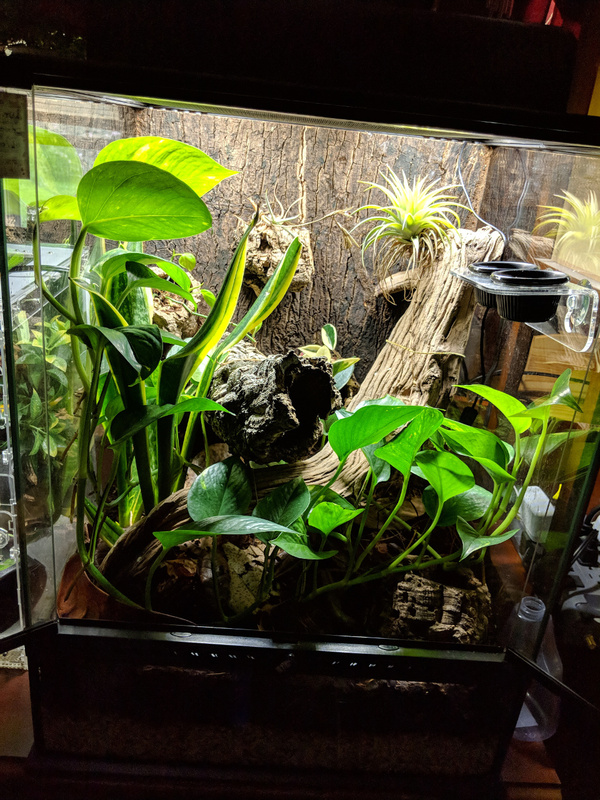 Some photos of the bioactive enclosure after cycling and Luna's move-in day. 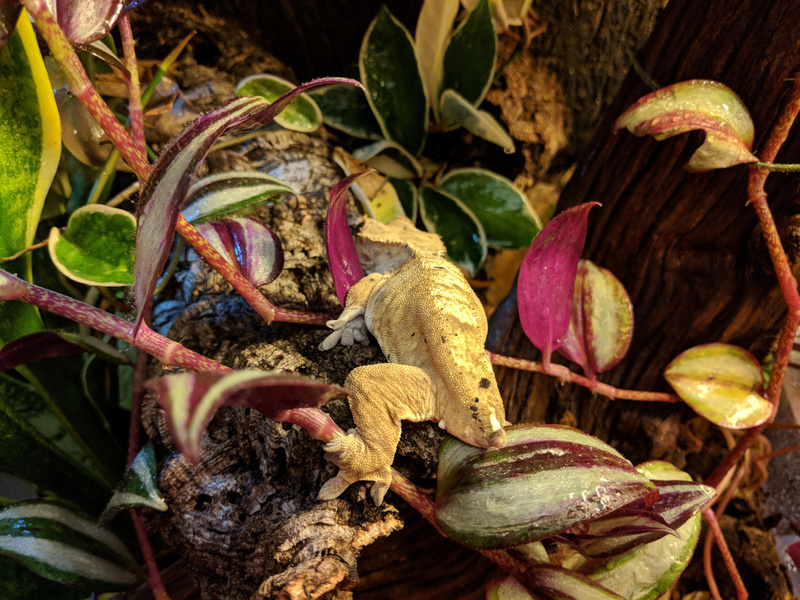 Luna is very happy over a month later, although most of the plants are giving me trouble at this point. Except the mighty Sansevieria, immortal plant of legend! 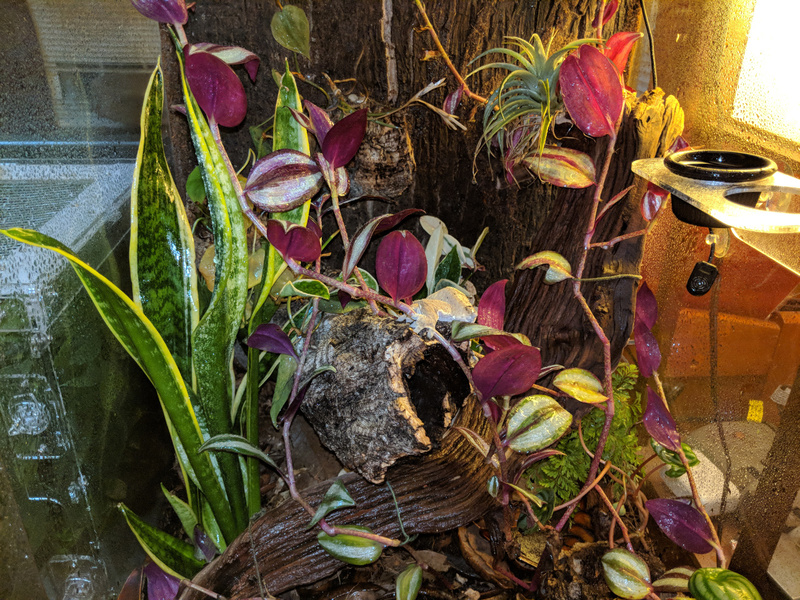 Trying to determine if too much water, too little water, or general substrate issues... You can see the dieback starting in these photos, but I've basically lost all the Philodendron and most of the Wandering Jew at this point. Tried watering more for now, and we'll see if that helps. Looks great! 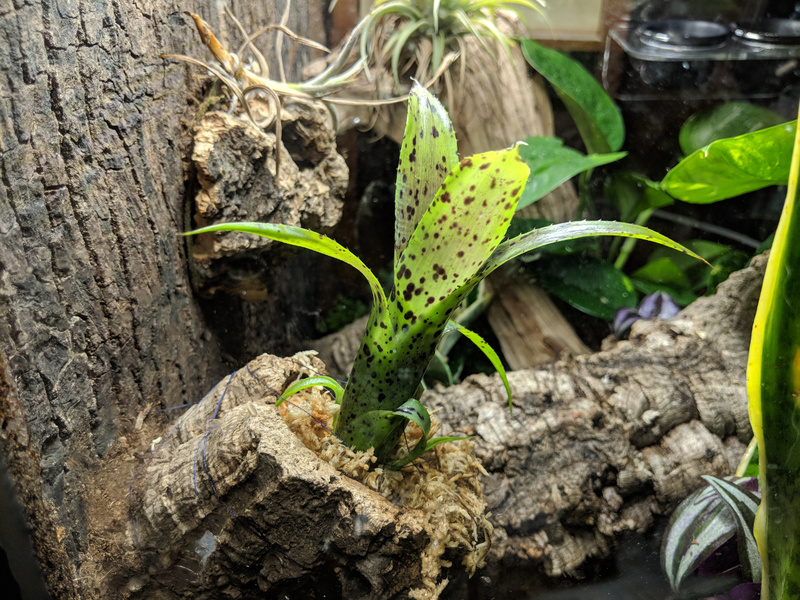 I have killed quite a number of Sansevieria in crestie and garg enclosures. 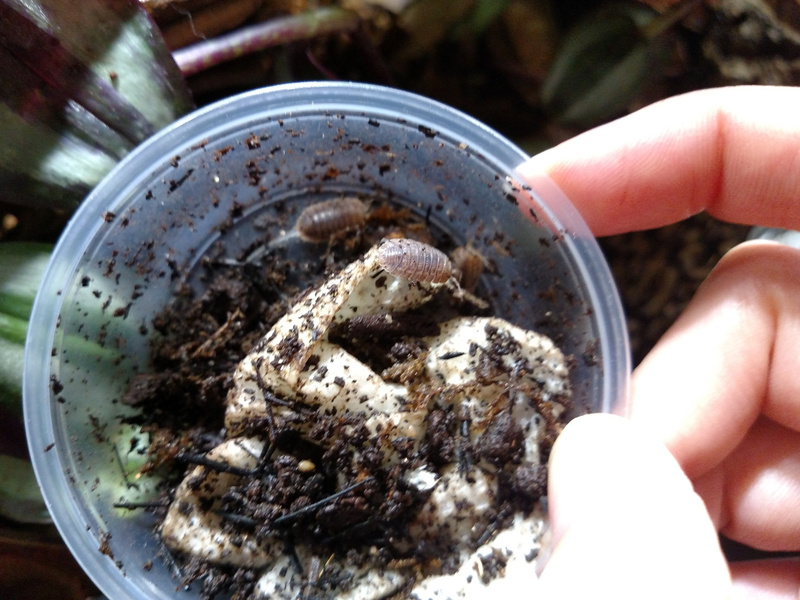 I think, even though they are recommended for these enclosures, that it's too moist for them. My old standby is pothos. I also had a good experience for a number of years with an anthurium and also bromeliads. 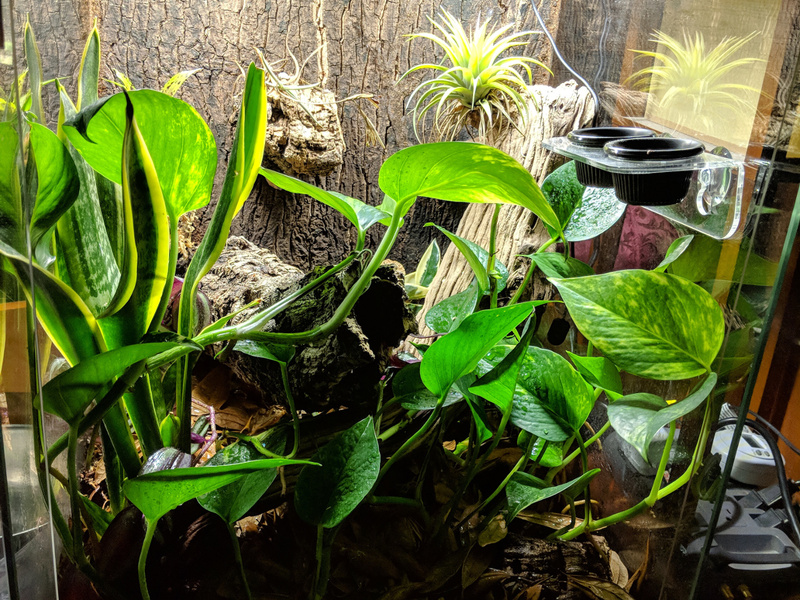 I've killed a few Pothos too... lol Since the Sansevieria is making it, I'm hoping that all I'm doing wrong is not watering frequently enough, but I guess we'll see. 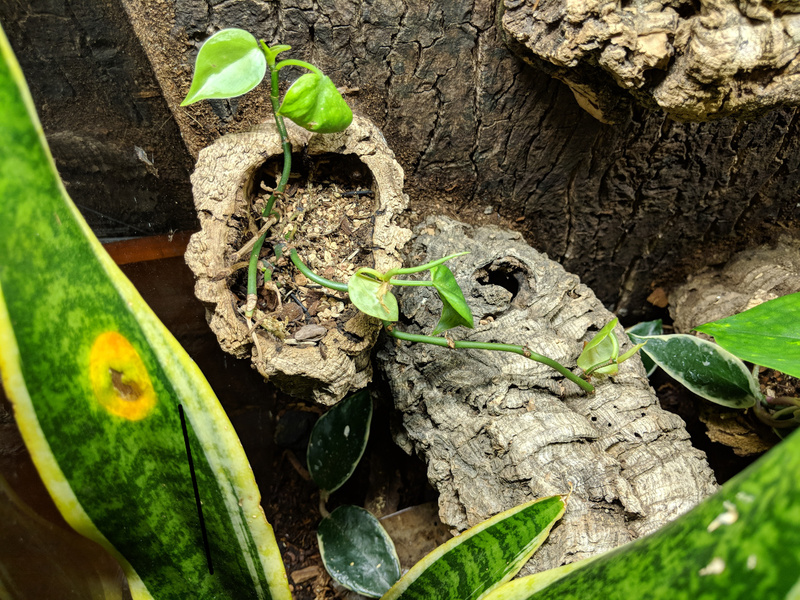 Really want to figure out what I'm doing wrong in the crested gecko bioactive enclosures so I can keep a variety of plants going. 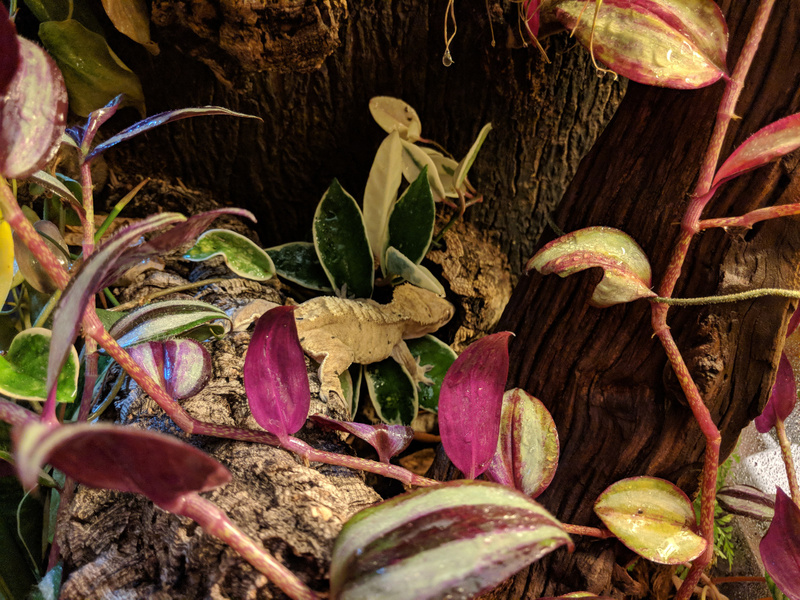 So, long story short, I lost the Wandering Jew, and the Philodendron was reduced to a bare vine. 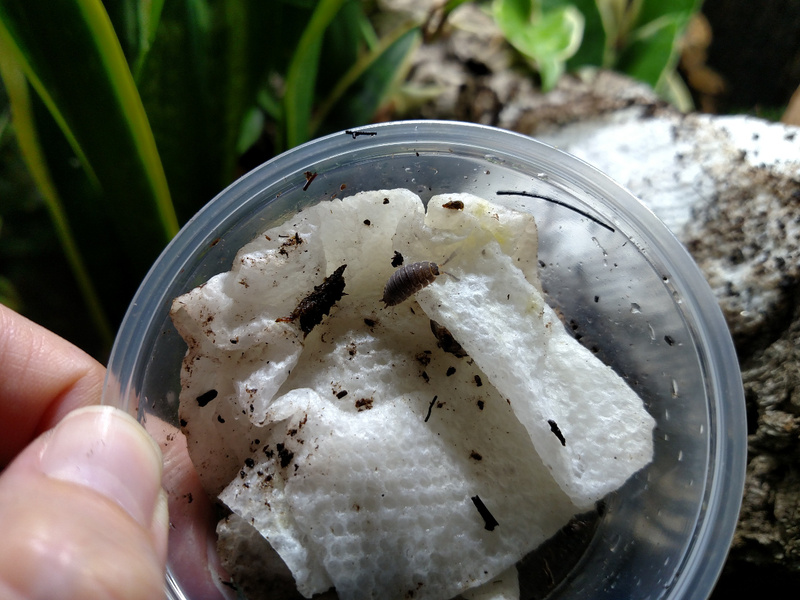 Some soil testing helped me discover that my substrate was pretty bare on nutrients and slightly alkaline, which is why I lost the acid-loving plant species but the hardy Sansevieria and fern were okay. 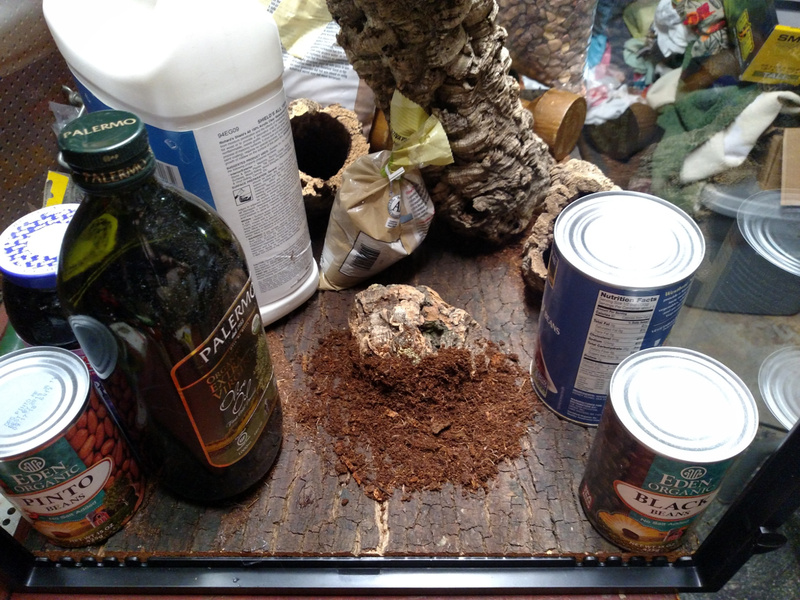 I've started using the BioBizz fertilizers available from NEHerp every 2-4 weeks, mixing in a little bit of organic apple cider vinegar to keep the soil more neutral. 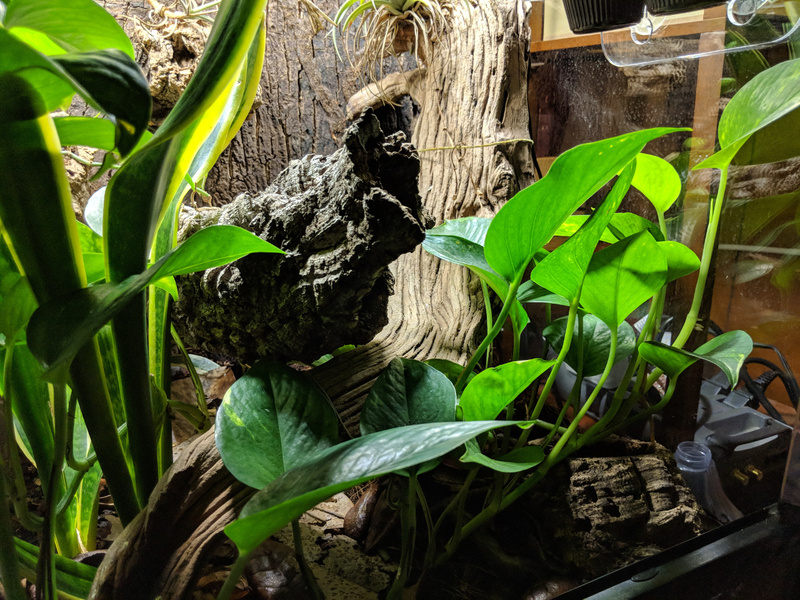 I added a Pothos, as recommended by Aliza above, and it's really taken off! The Philodendron is struggling. It keeps putting out leaves and losing them, so I need to figure out what's going on there. 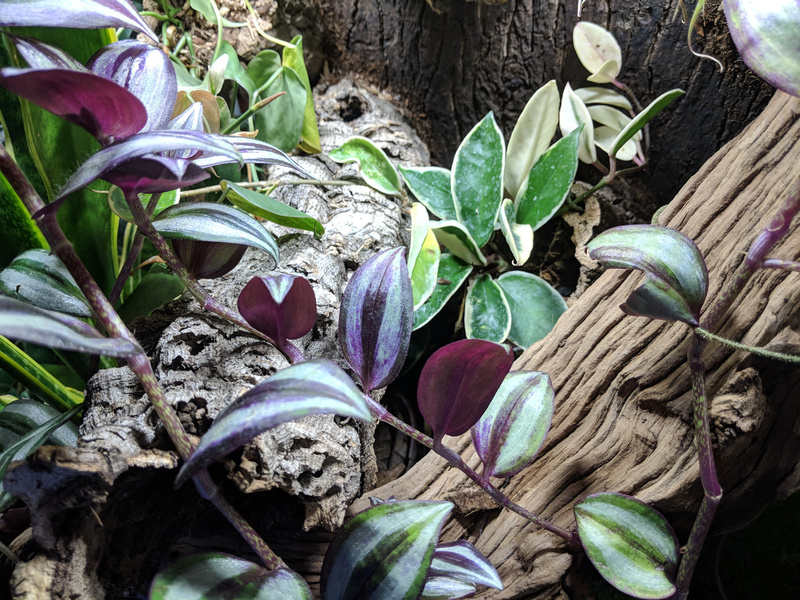 Would love to be able to add back a Wandering Jew for color at some point, if I can figure out how to keep it alive! Luna is loving it though, especially her little floating hiding log. 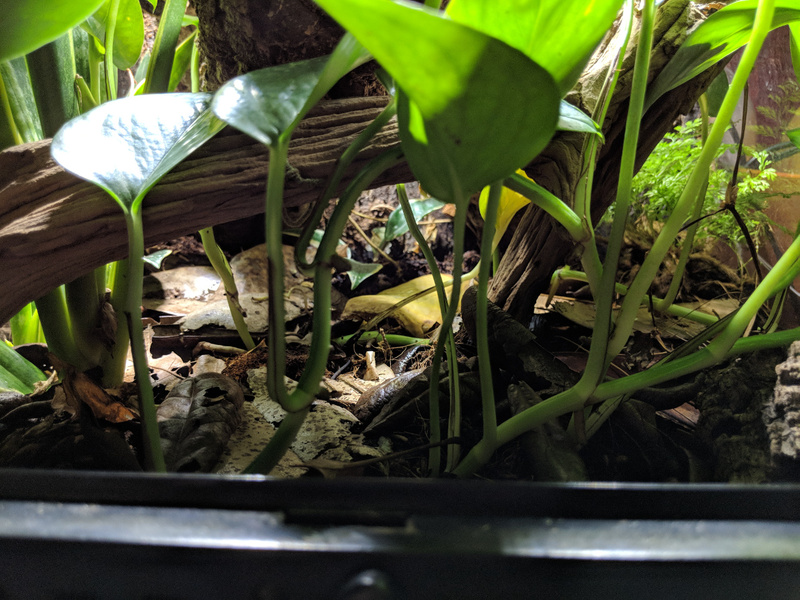 Pothos is keeping my planted vivs "in business". 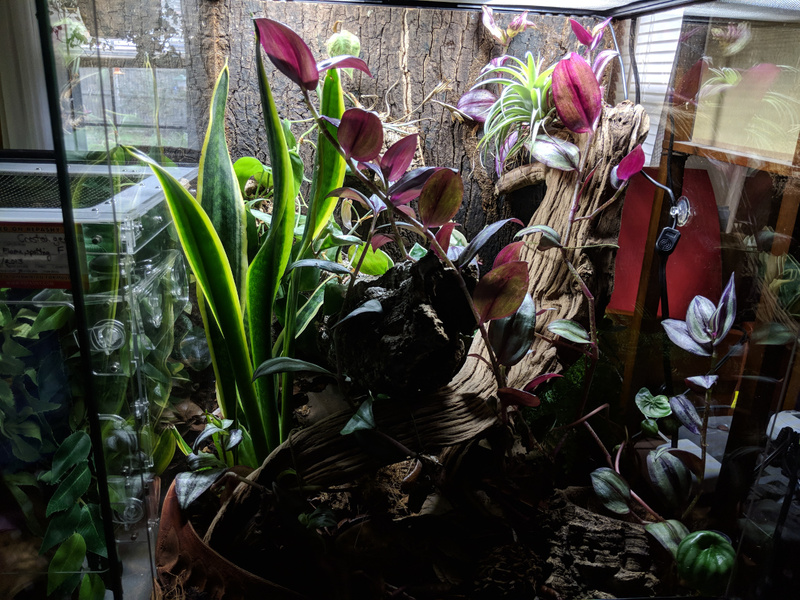 Did some rearranging today to try to improve the plant community. 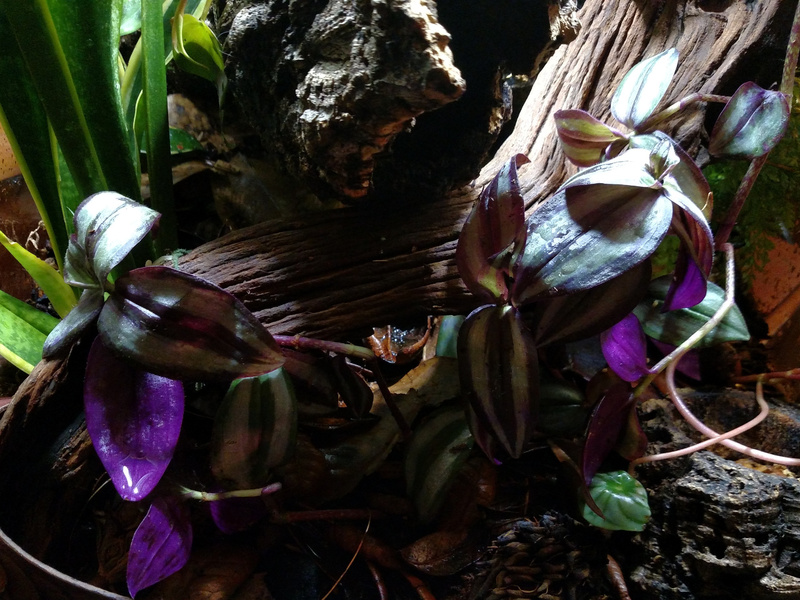 I really wanted to try wandering jew again (Tradescantia zebrina), and the heart leaf Philodendron (Philodendron scandens) just wasn't doing well in its current location. The Hoya in my wall planter needed to be pruned because the new growth was all white, which is supposedly bad for the plant in the long term. There were more Hoya sprigs growing at ground level that could be moved to fill in the wall planter. The Philodendron was moved to the floor with one bunch of wandering jew. 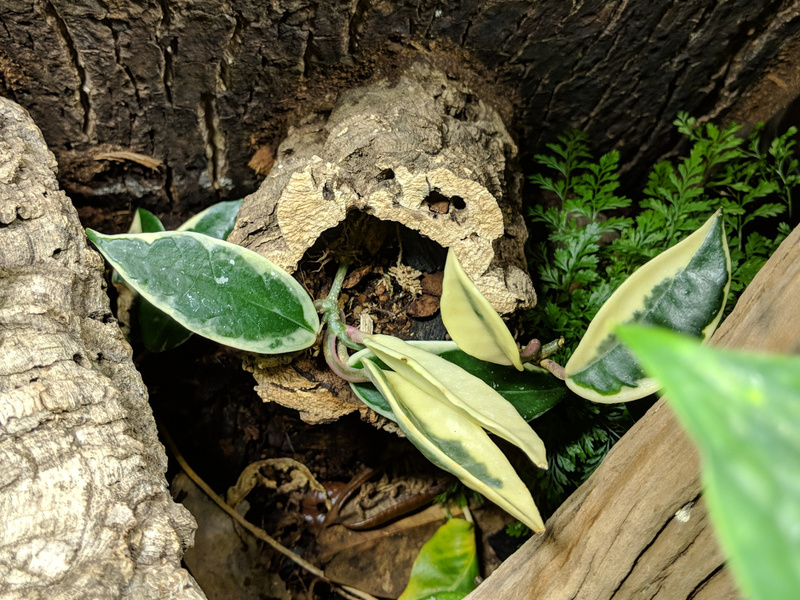 The Hoya from that spot was added to the wall planter with some more substrate. 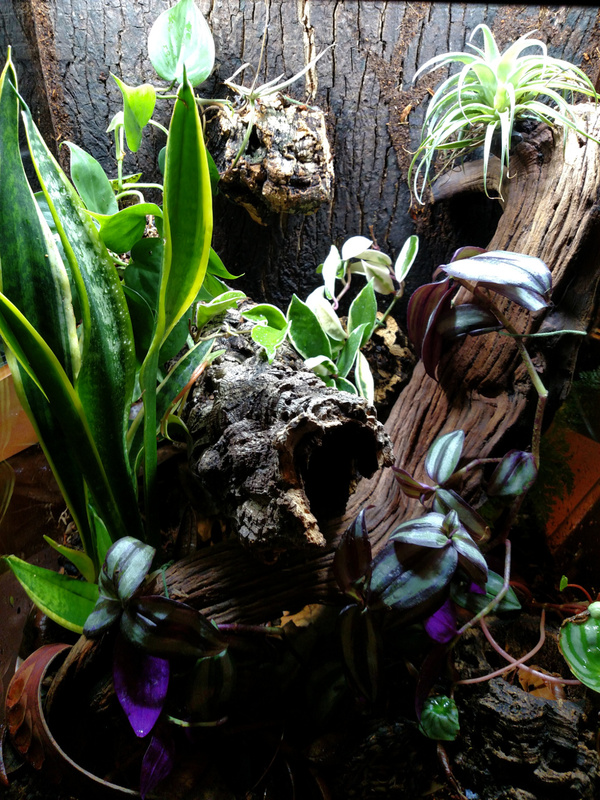 For the upper wall planter, I'm going to try a bromeliad (Neoregelia pauciflora). 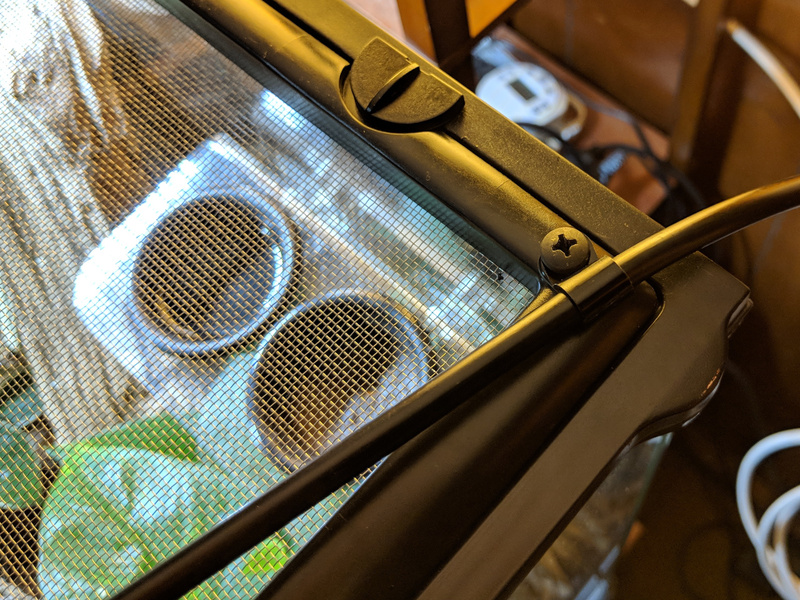 Little technological improvement -- an automatic misting system! This is a MistKing Starter system v4.0. 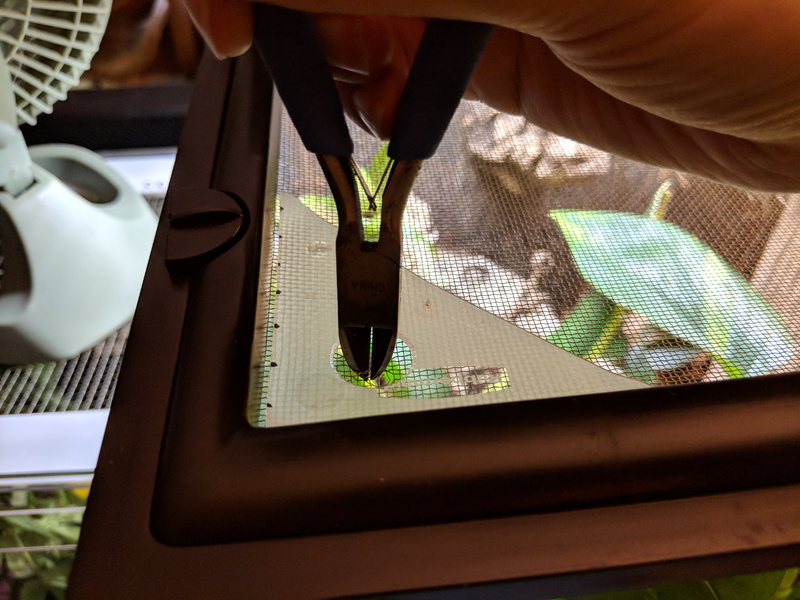 I realized after I got it that I needed a screen wedge that was not included in the set... so I made my own! 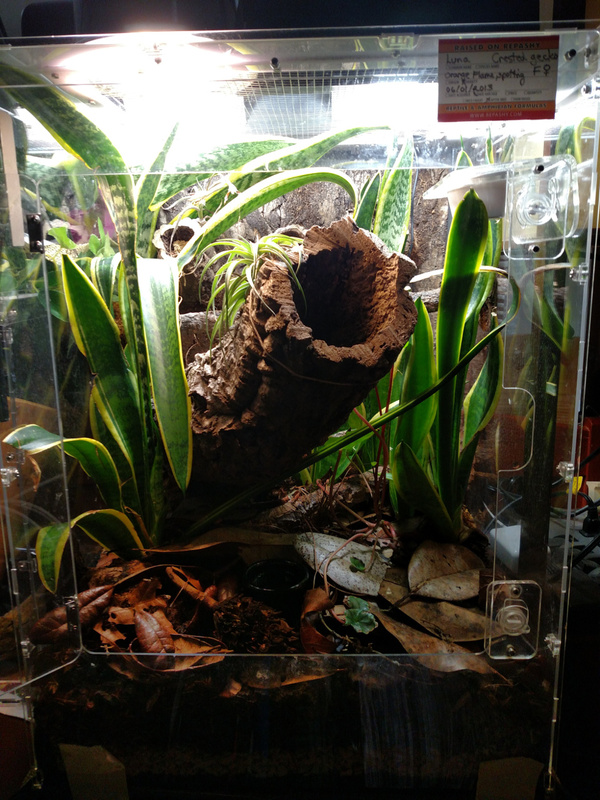 MistKing install into the Exo Terra 18" x 18" x 24" vivarium. 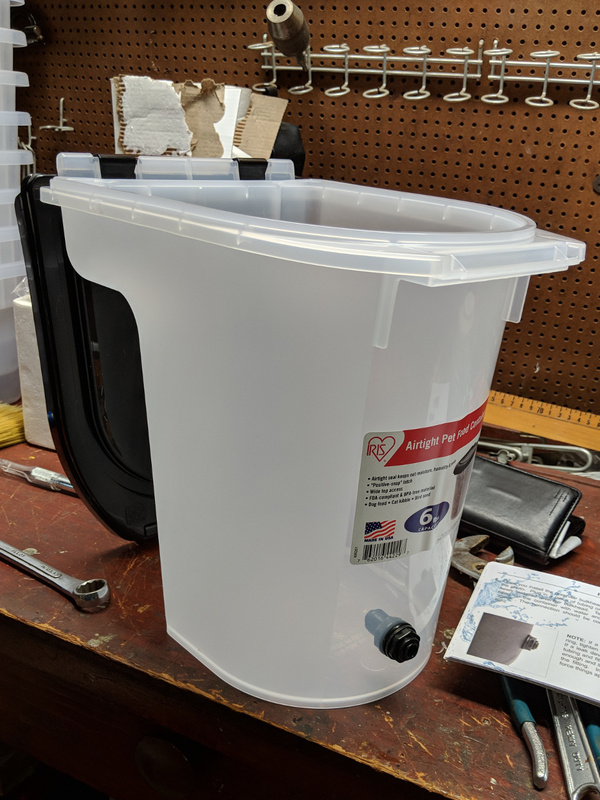 Bought a 6-qt pet food container to use as the water reservoir. 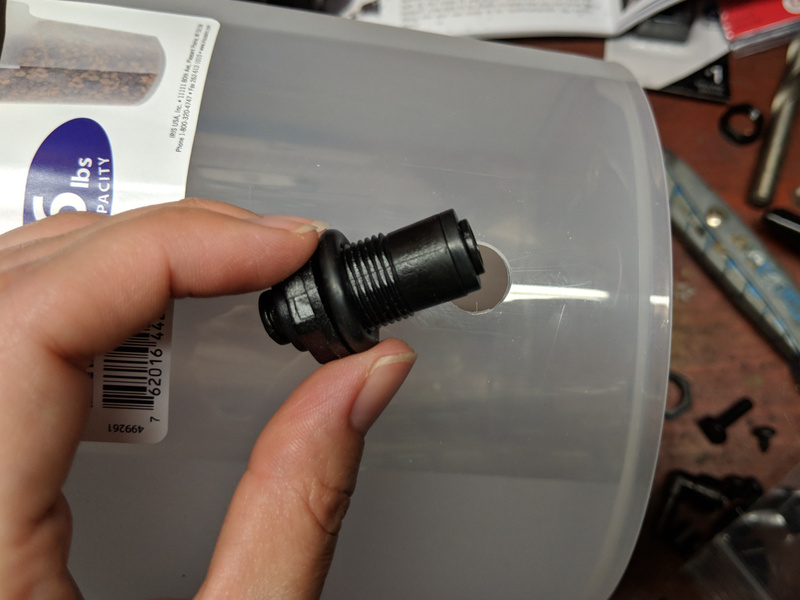 Used the bulkhead nut to mark the center of where I wanted the bulkhead, drilled a 7/64" pilot hole, then used a step drill bit to make the 9/16" hole needed for the bulkhead. 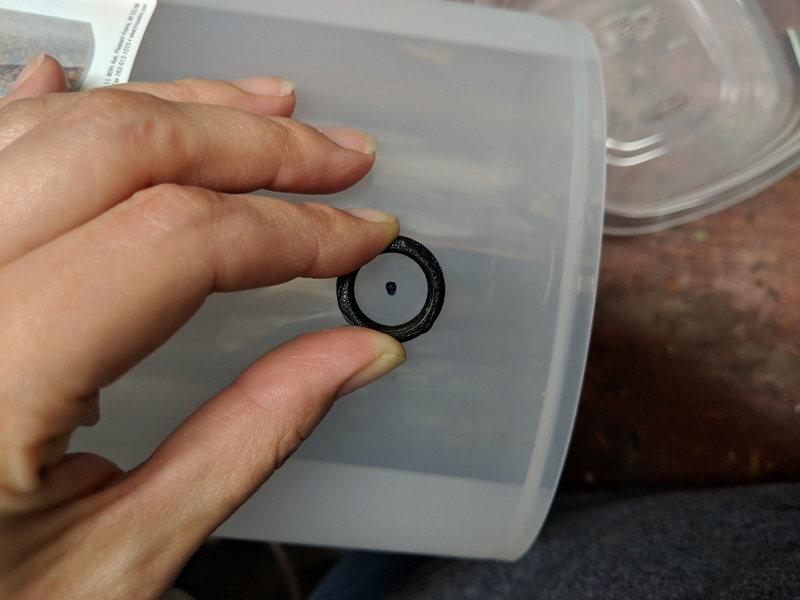 Inserted bulkhead with o-ring through front, then tightened nut onto back inside container. 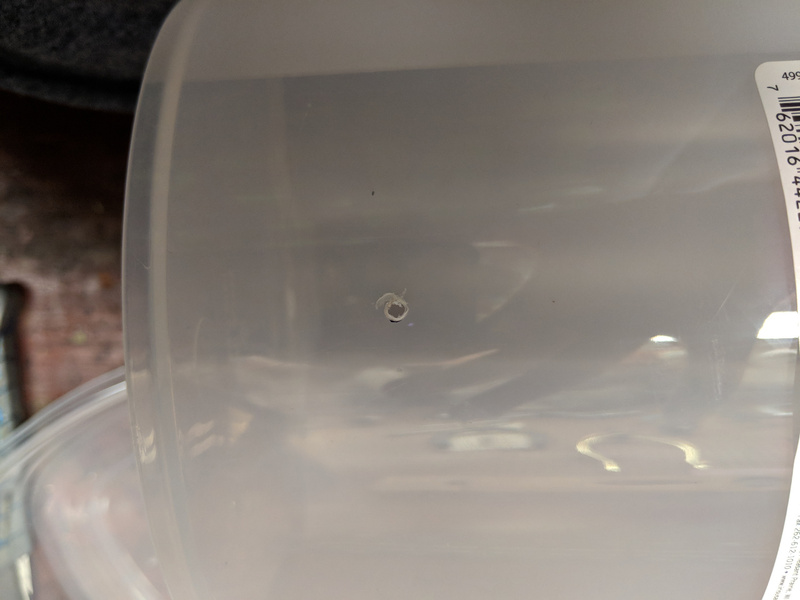 As recommended in MistKing guide, plugged in the tubing and filled with water to test. First time leaked, so had to tighten up nut inside. Second test worked like a charm. Now for the screen wedge that I didn't have. 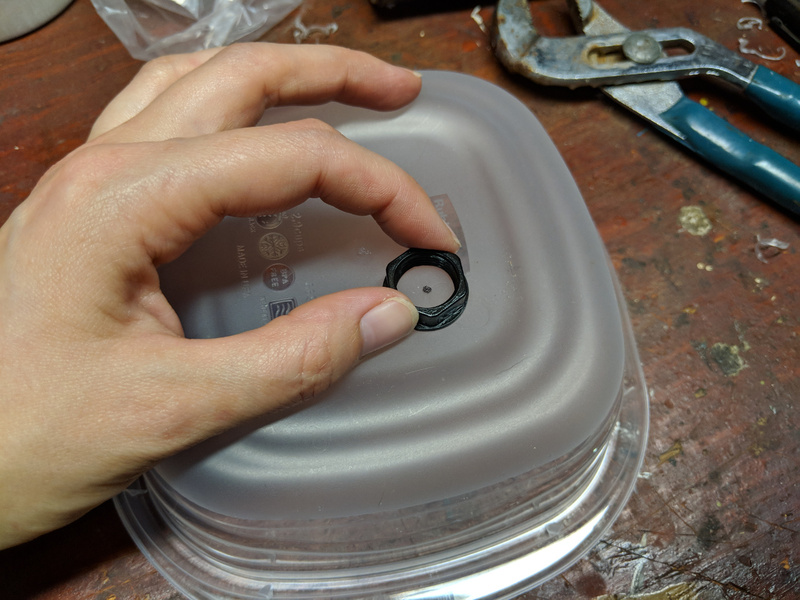 All I really needed was a sturdy piece of something to sit on the screen top of the Exo Terra, so used a little tupperware food container. 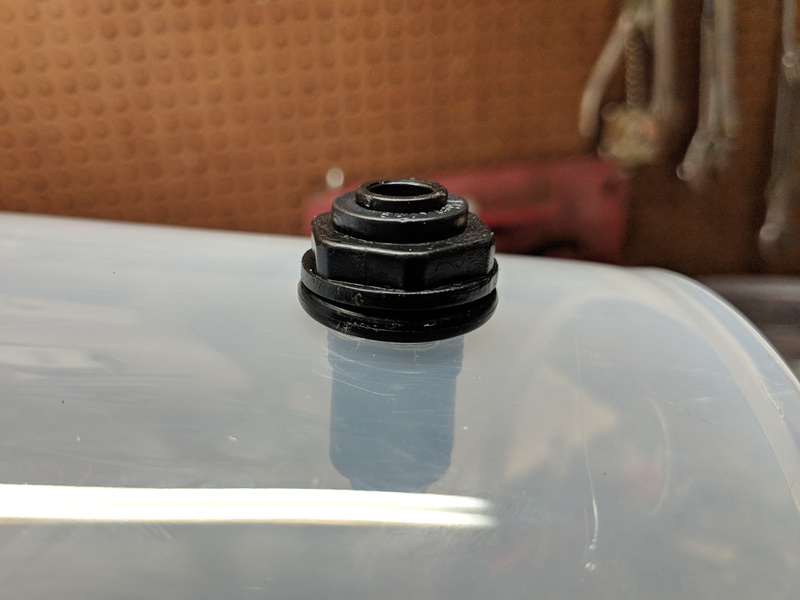 Used mist assembly nut and tried to center it between one corner and the middle of the container bottom. 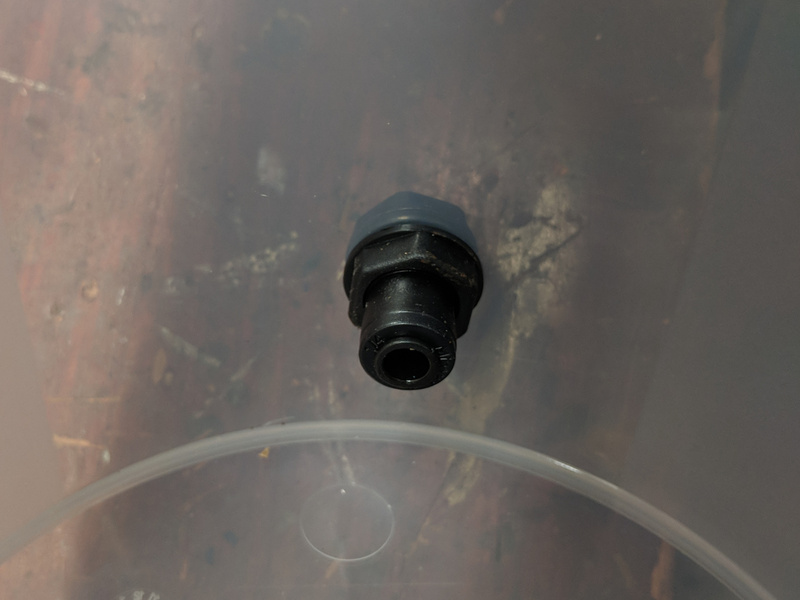 Again drilled 7/64" pilot hole and followed up with step bit to make 5/8" hole needed for mist assembly. 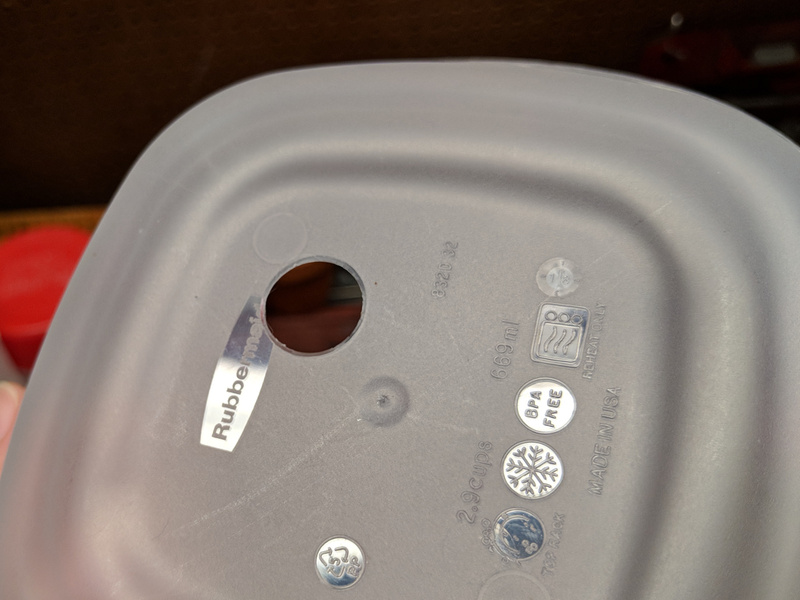 Cut down the container using kitchen shears. 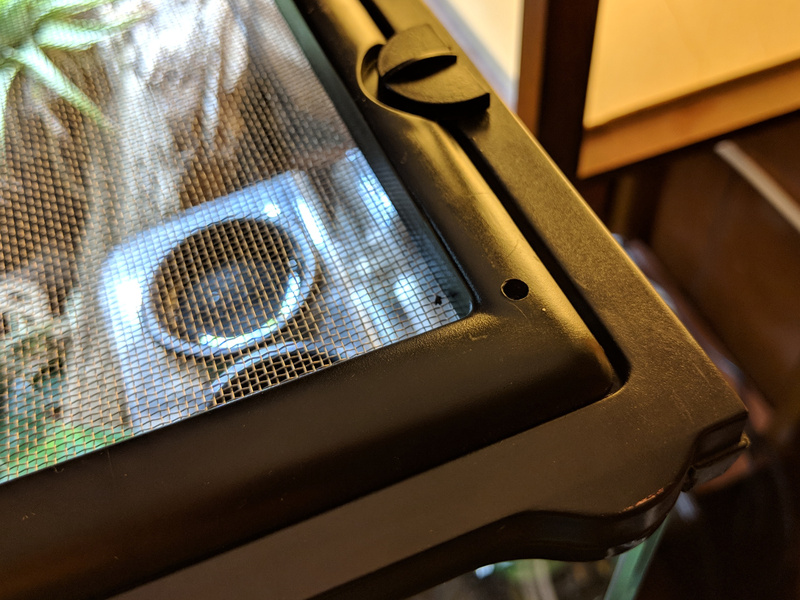 In order to get the plastic to fit the Exo Terra top correctly, I needed a corner on it, so I found a ruler with a corner and centered the hole where I envisioned it being in the corner of the screen top. Used marks along the straight edges to cut a decently straight triangle of plastic. Now, we have a homemade wedge. 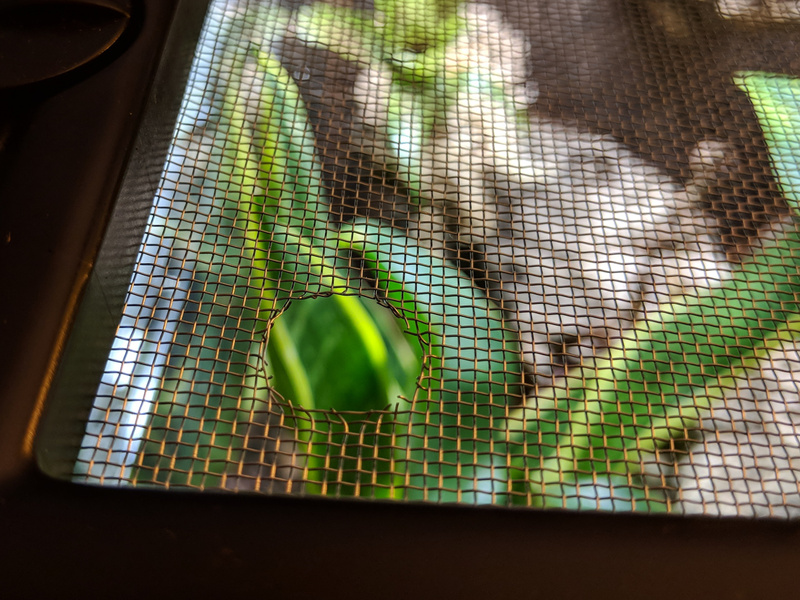 Positioned in the corner of the screen top where I wanted the misting assembly, then used some little wire cutters to start a hole. Pushed the assembly up through the bottom, then removed and used the clippers to trim the hole nicely. Inserted misting assembly for final time and tightened up nut on top of wedge. I wanted to fasten down the tubing because if it swings around and hits things, it makes a heck of a vibration racket. 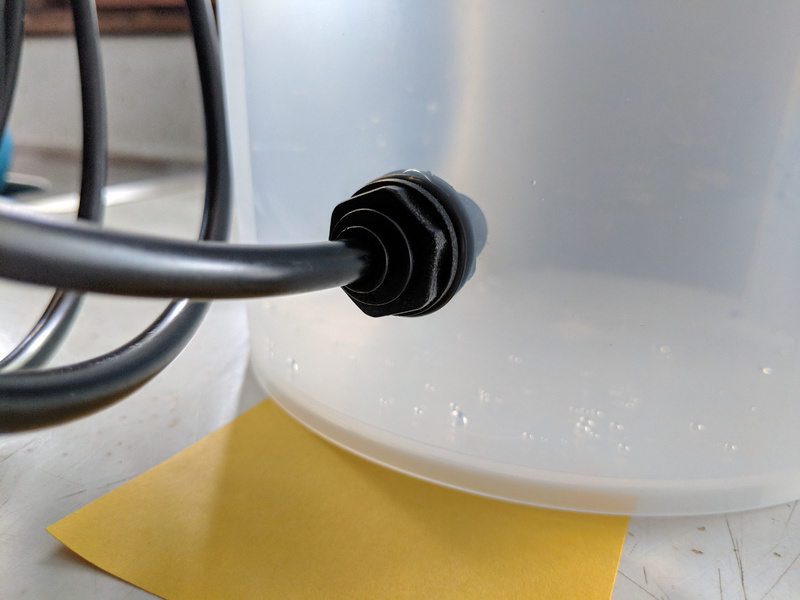 The kit came with tube clips and screws, so I figured out where I wanted to fasten down the tubing, drilled a 9/64" hole into the lid edge, then screwed in the tubing clip there. 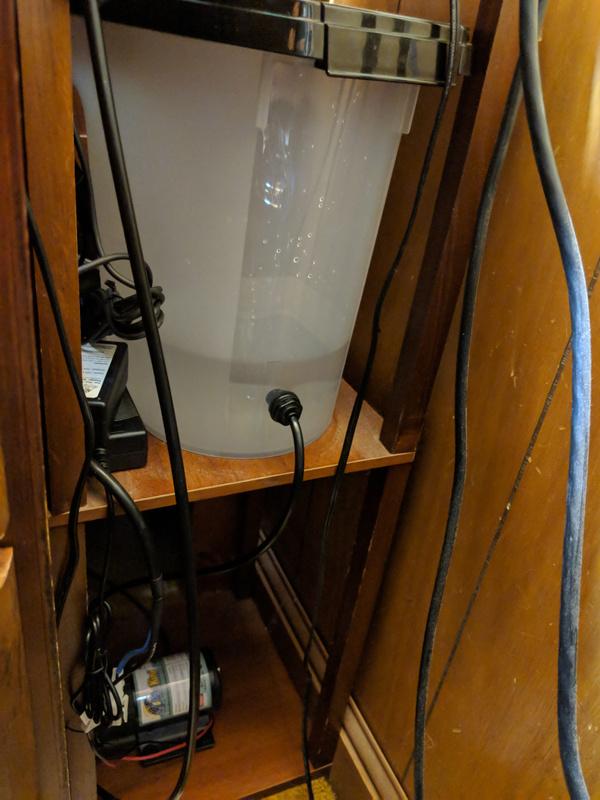 Had a handy shelved lamp next to the cage, so I used that to hold the reservoir and pump, twist-tying the tubing down so it won't shake when the pump starts.